If you’ve got your finger on the pulse you’re bound to have already heard this but we figured it’s probably worth a mention regardless. 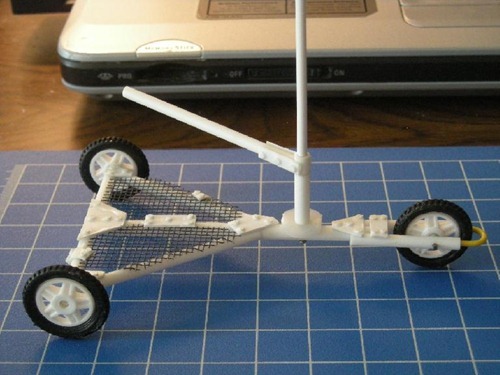 A new plastic buggy kit is coming in October this year. 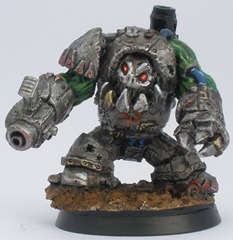 Us doddering oldsters who remember Gorkamorka might remember the rather glorious metal conversion kit that was introduced featuring a rather excellent Brian Nelson sculpt and a rokkit launcher. 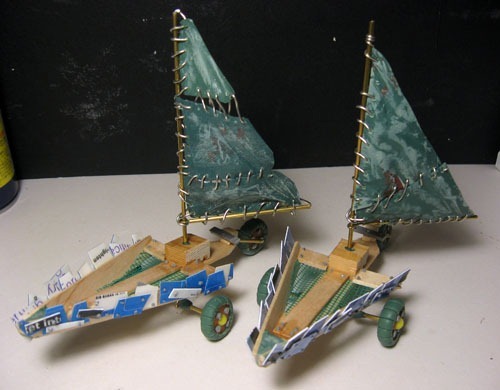 Oddly enough the mid ’90s plastic kit stayed in production until, well at the time of writing it’s still available! 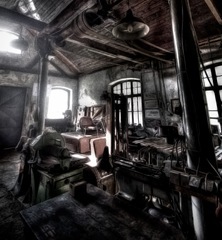 However the metal parts that made it fit in with modern stuff is long gone. Odd. 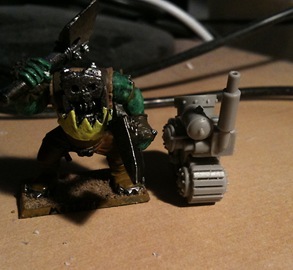 Especially odd given that they still sell the metal Dregmek Blitzkart special character from Gorkamorka! By my deeds, I honour him. Fox Box does a load of other stuff too but this stuff is new and most relevant right now. We’ve also just added Flamekebab’s Gorkamorka Alternate Models List to the side bar – it’s pretty exhaustive if you’re looking for bitz. 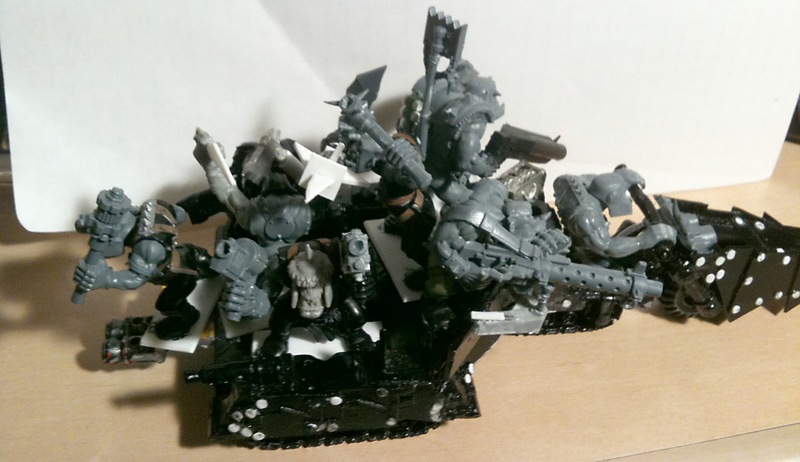 Samsonov on the Tactical Command forum has put together a scaled down version of Gorkamorka! 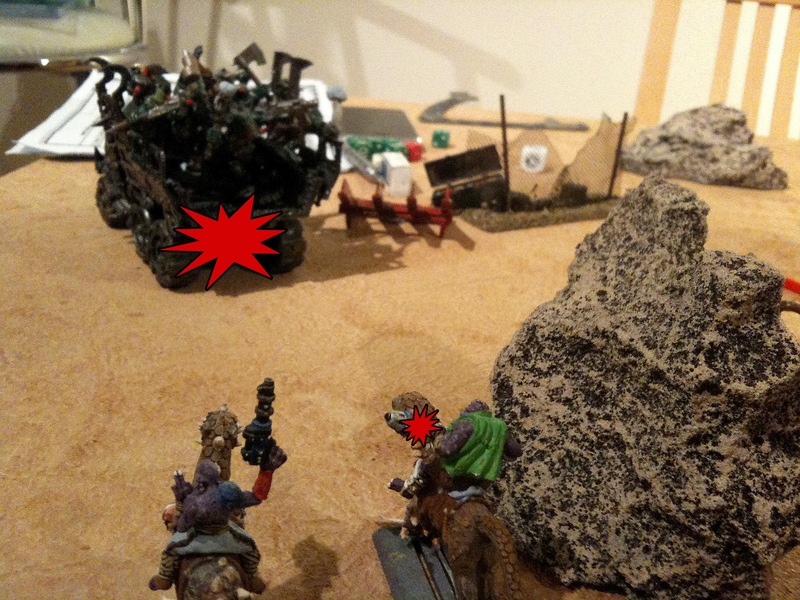 Yep – those are Muties taking on some Epic Orks! 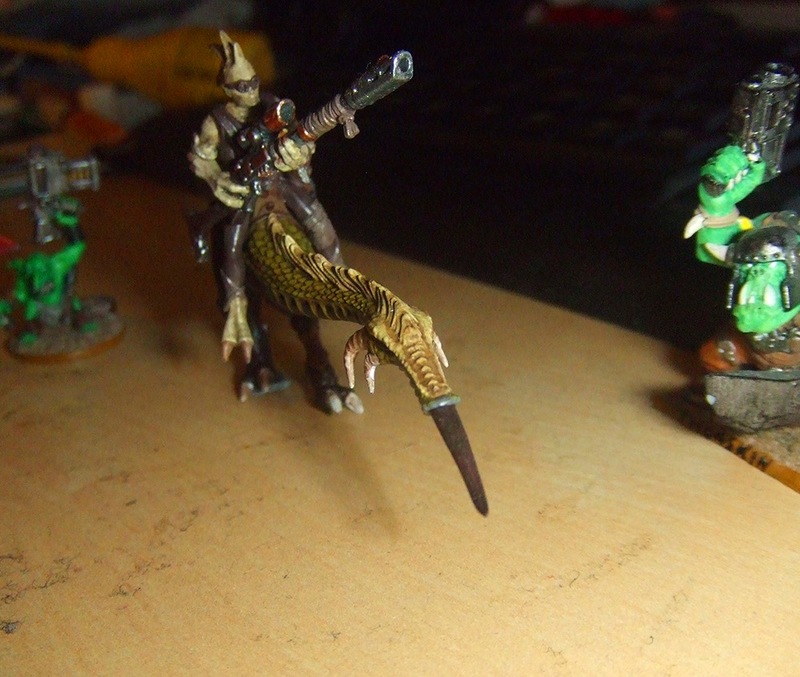 Apparently they Muties are made from Microworld Games’ Dread Outriders and their Raptor Dragoons. It’s from White Dwarf 221, May 1998, so presumably the photos are from April, perhaps earlier. 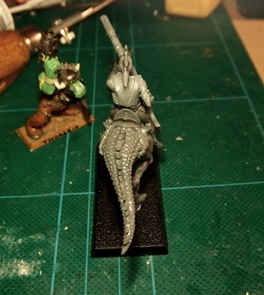 It’s a bit of a shame that they never released the Mutie steeds without saddles (as the photo shows the saddles were added to casts of the steeds). They’d have been handy for a bit of themed terrain, don’t you think? 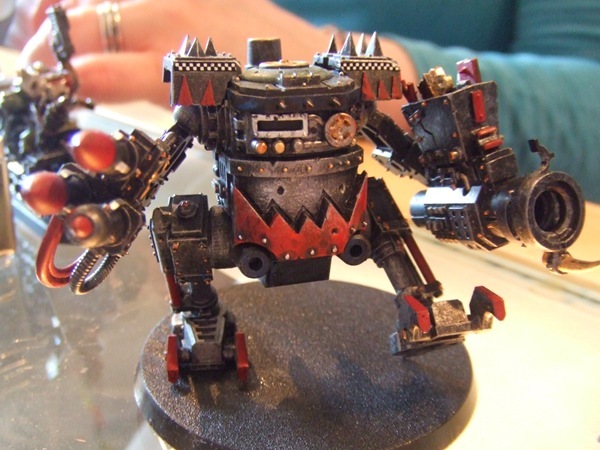 If you haven’t already you might find it fun to take a look at the Gorkamorka index. It’s based on work found on the (now defunct) GameHobby.net section “Exodite’s Gorkamorka Index“. The updated version over on /r/Gorkamorka’s wiki has some gaps in it but over time they’re being slowly filled in. 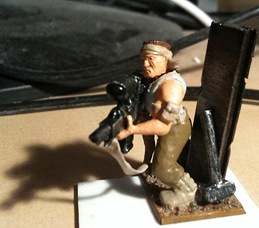 Today one more entry can be crossed off – Doc’s Serjery from White Dwarf 221. It’s only a single page but it does hold the distinction of being one of the only places the painted bioniks have appeared. 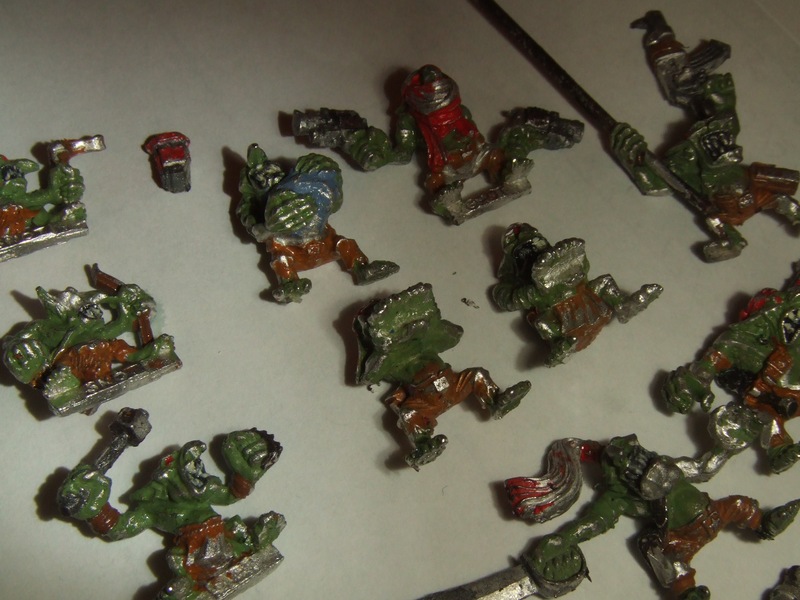 Back when Gorkamorka was being sold these were sold in a mixed blister pack for £6 – about £9.50 adjusted for inflation! 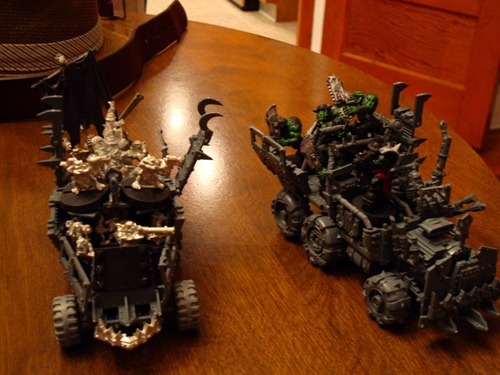 GW did make bioniks for Orks before this (in 1992) but as far as we know none of those old parts were reproduced to create this line, despite being about the same scale. 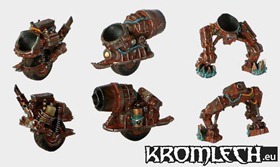 Anyway, if you’d like to see the sorts of things that were available back then (and why we praise Kromlech’s bioniks by comparison!) take a look at the single page PDF below. Every now and again we post a link to some new model or fun conversion bitz that have come to our attention. We’ve not been doing that lately though because in the time between tUGS’ founding and now there’s been a veritable explosion of parts. There’s still lots of gaps but in many areas you guys are spoilt for choice. The problem is that there hasn’t been a central list of what’s out there. Not any more! 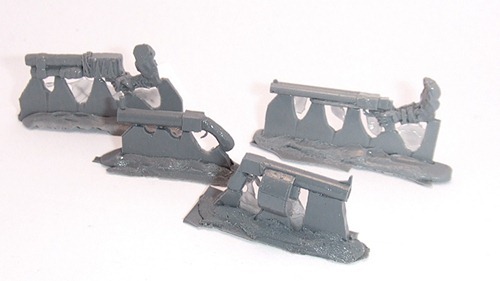 They’re MaxMini Steam Rifles and by the looks of things would be ideal armaments for Muties. At the moment a pack of ten will set you back just over a fiver. 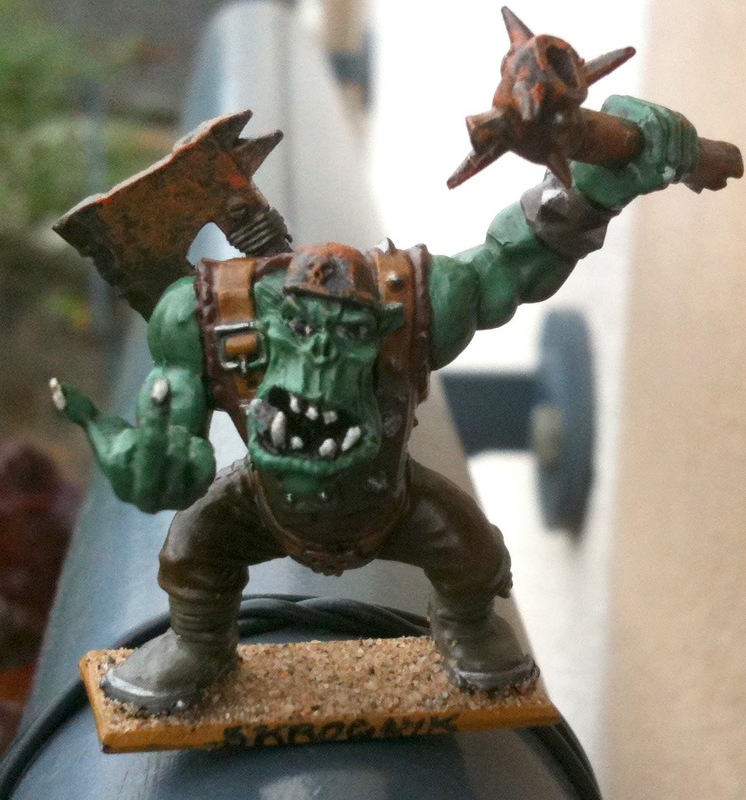 Before Gorkamorka Orks were still green but their appearance was much less brutish. 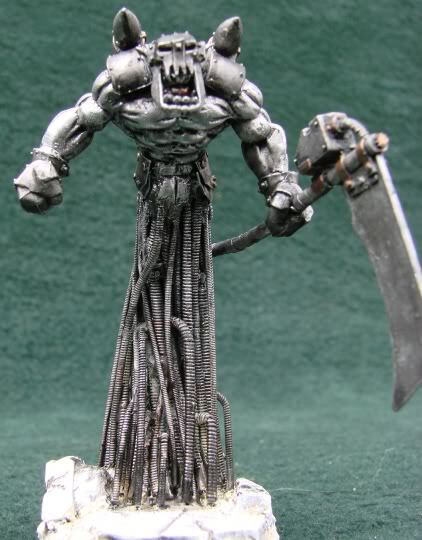 The new savageness was brought to life by a particular sculptor – Brian Nelson, or at least that’s who this White Dwarf attributes it to. Originally published in White Dwarf 216 (December 1997) this four page article isn’t just about GoMo but it’s a solid read nonetheless. 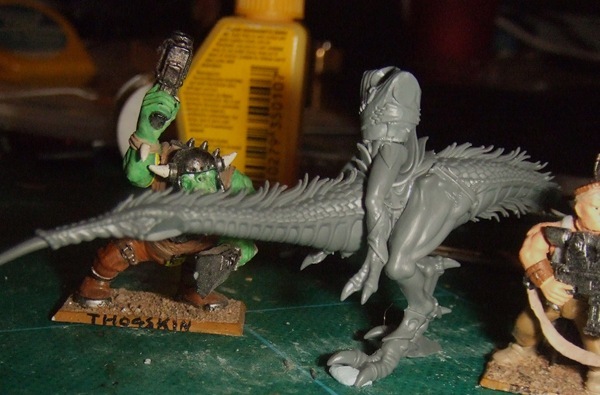 In Gorkamorka there’s only a limited number of options when it comes to body armour. 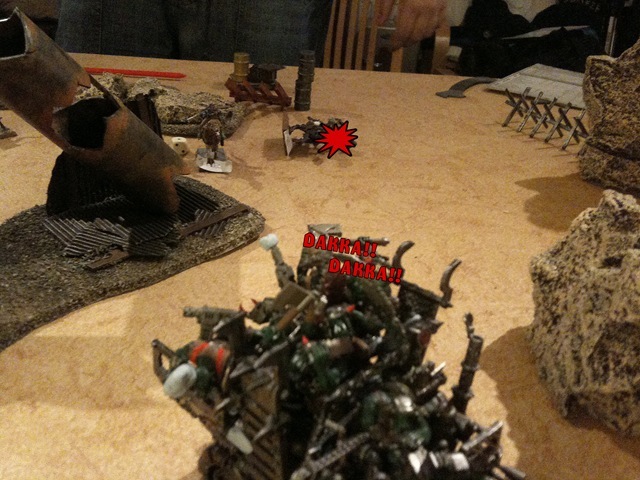 Generally it’s not worth bothering with if you’re playing as Orks. Natural toughness and a stubborn unwillingness to die provide ample protection and that money could be better spent on more killy stuff! That said, there’s shields. They provide a saving throw against hand to hand weapons and things like bows (see page 59 of Da Roolz for details in full). More than that though they give the warrior a parry. 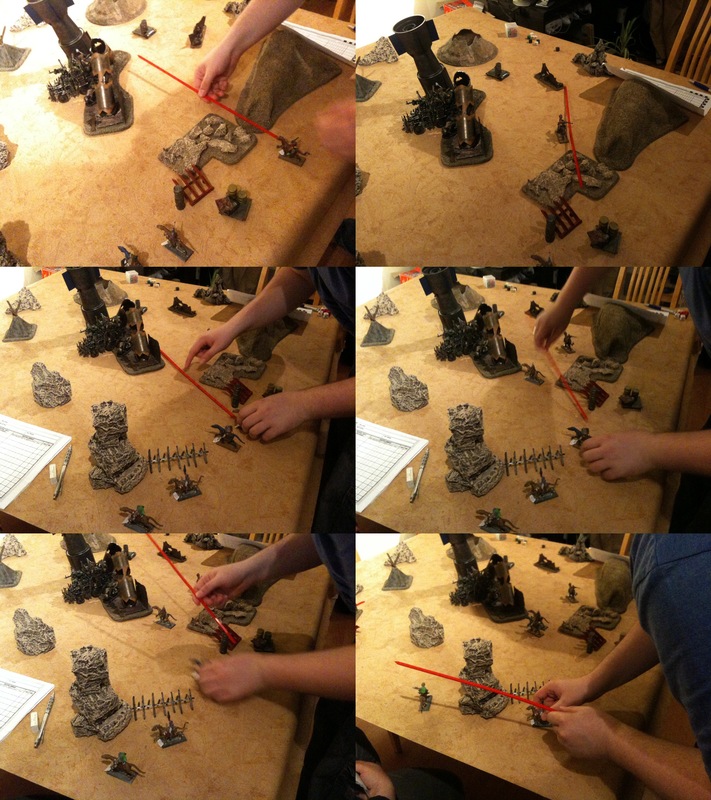 Those familiar with Necromunda or the Dust Rat rules will already know what that is – an opponent can be forced to re-roll one of their attack dice in hand to hand. Given that a high roll can be the difference between victory and death it makes all the difference! 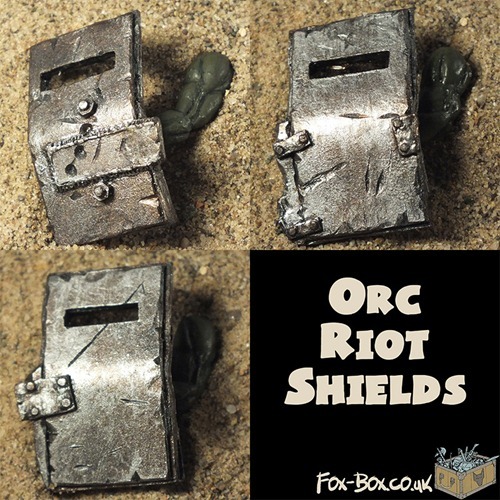 Shields also have the advantage of only costing 1 toof and looking well ‘ard too! They’re available on Fox Box in the three designs pictured. 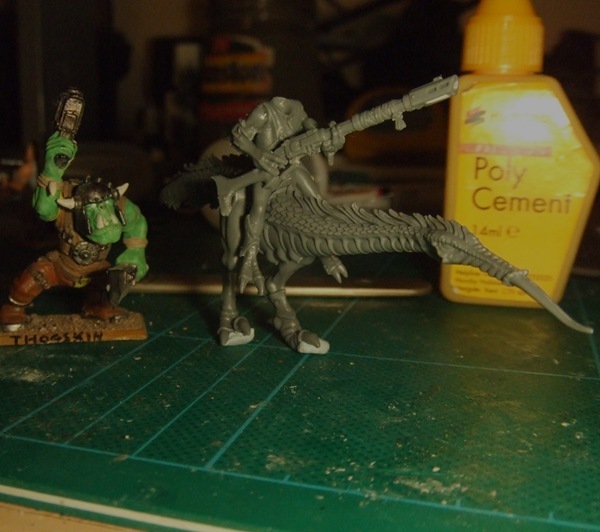 As you can see in these other photos they’re sized for 28mm greenskins and probably fit with parts from other manufacturers who do the same scale. 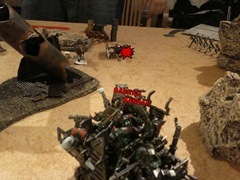 The Turnin’ Hook seems vaguely useful although mostly for awesomely Orky tactics but 5 teef does seem bizarrely high. Given that all the gubbinz in this article have the same price one has to wonder whether there’s a typo. It hasn’t been updated in Gubbinz #1 but it doesn’t seem like the sort of thing a proof reader would pick up on anyway. The Spike Droppa costs the same and is a fairly puny area denial weapon (S2 hits on infantry, D3 S3 hits on vehicle wheels/tracks) – some how that doesn’t seem right. Similarly the Boosta Rokkits are single use with a serious risk of causing real damage to the vehicle they’re mounted on. The pricing just seems off on all of these things so perhaps an FAQ ruling will be needed at some point. 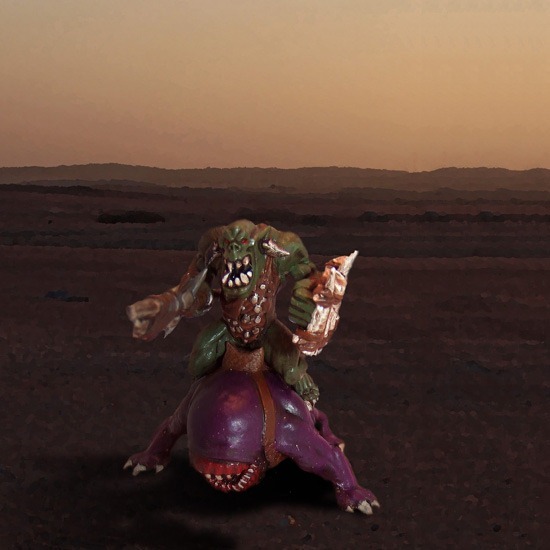 Long ago when the site was fairly new we posted Mad Meks as taken from Gorkamorka Gubbinz #1. Since then serious effort has gone into acquiring the articles we’ve were missing so we’re going back and filling in the blanks at last! Whilst these rules are the same as the one in Gubbinz this version is the original from White Dwarf 217, written by Gav Thorpe. 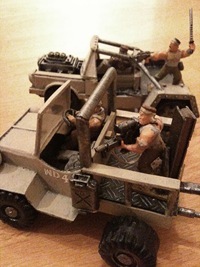 Interestingly one of the gubbinz in the article, Shoutas, actually allows a vehicle to cause Fear. In order to board a leadership test would need to be passed. 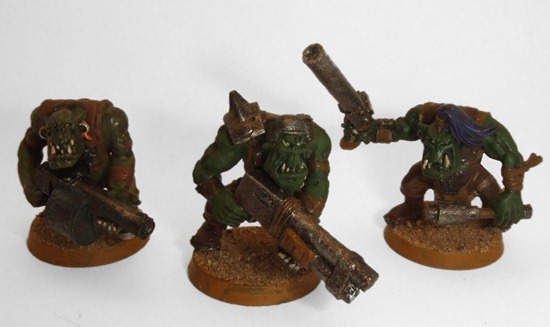 That might actually be somewhat game breaking when it comes to Rebel Grots – their Leadership is extremely low and they rely on boarding in combination with their Pilin’ On rules to even the odds. Just a snippet of an article this time, mainly for completeness sake. We don’t know about you but when we look at the article index bits left out make us curious. In terms of credit the models pictured include work by Martin Footit, Richard Baker, Ben Jefferson, Adrian Walters, Rich Potter, and Jim Butler. 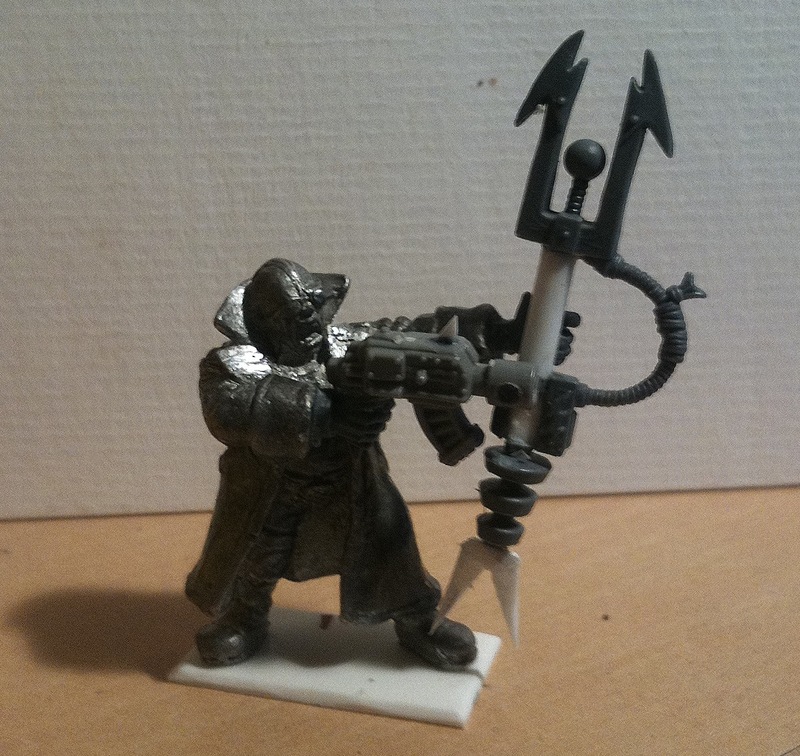 This one is from White Dwarf 216. You might recognise some of the pictures from the third edition Warhammer 40,000 Ork codex! 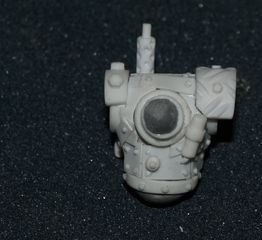 The Volkite Caliver Set (Found under Horus Heresy if they move it in time). 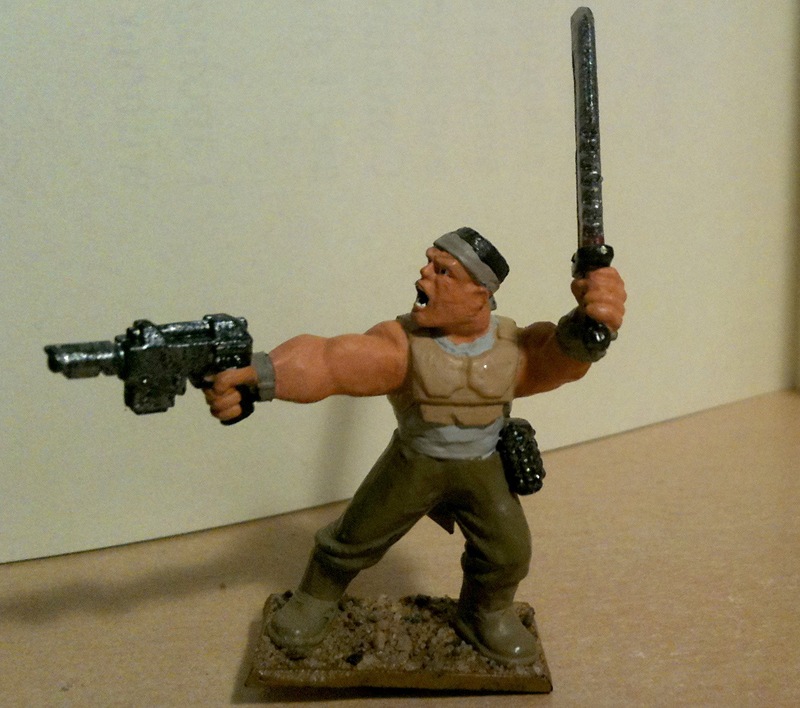 They’re far from cheap but apparently that’s what Imperial calivers look like. The rules for them can be found on page 65 of Digganob. Remember Flamekebab’s Outlaw MC rules? 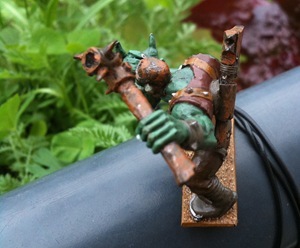 They’re standard Ork scale, resin, should fit with most things, although shoota arms might be a bit tricky on some of the ones that stick out a bit further. You can find them over on Fox Box. 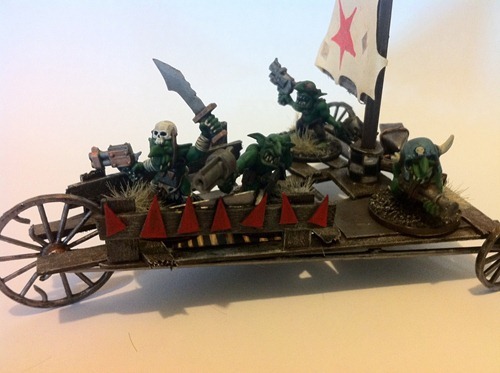 It’s not often that we post stuff for Rebel Grots but I think we’ve found something fun for you today. Over at GW-Fanworld there’s a thread containing some rather good links to some Rebel Grot conversions. 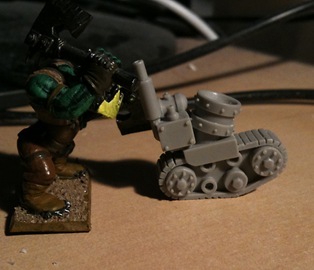 Next up there’s a cutta and big lugga built using a combination of the original Gorkamorka Big Lugga kit and the modern Ork Trukk kit, done by grimgob. There’s plenty more photos in the thread. There we go, some inspiration for you. Thanks to HiveTyrantPrometheus for collecting these links! Now for a bit of a change of pace. In Gorkamorka, unlike Warhammer 40,000, Orks can be armed with kannons. 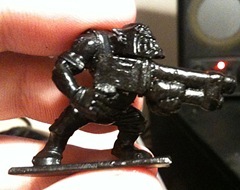 These are not the artillery weapons many of you know of from recent years but rather are chunky Orky shotguns. With the change in scale since Gorkamorka a lot has changed and it’s difficult to get hold of some weapons. 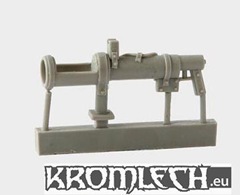 Conveniently Ramshackle games sell four kinds of shotgun arms that might, just maybe, be suitable for use on modern Orks. So here’s three of those designs, sculpted by our own Flamekebab with additional work (and the arms themselves) by Curtis Fell. The first is a standard pump-action design that some of you might remember Flamekebab sculpting and attempting to cast a long time ago. 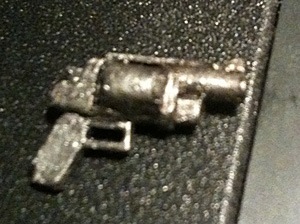 Then there’s a single barrelled weapon, as many cheap kannons are and lastly a drum magazine one based on the Striker. 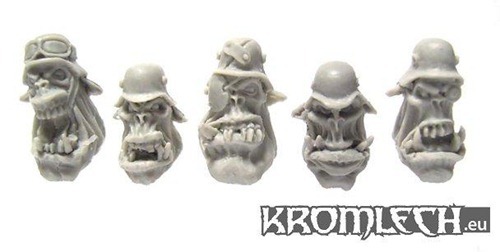 There’s also a Kromlech Orc War II head in there, as some of you may have noticed. 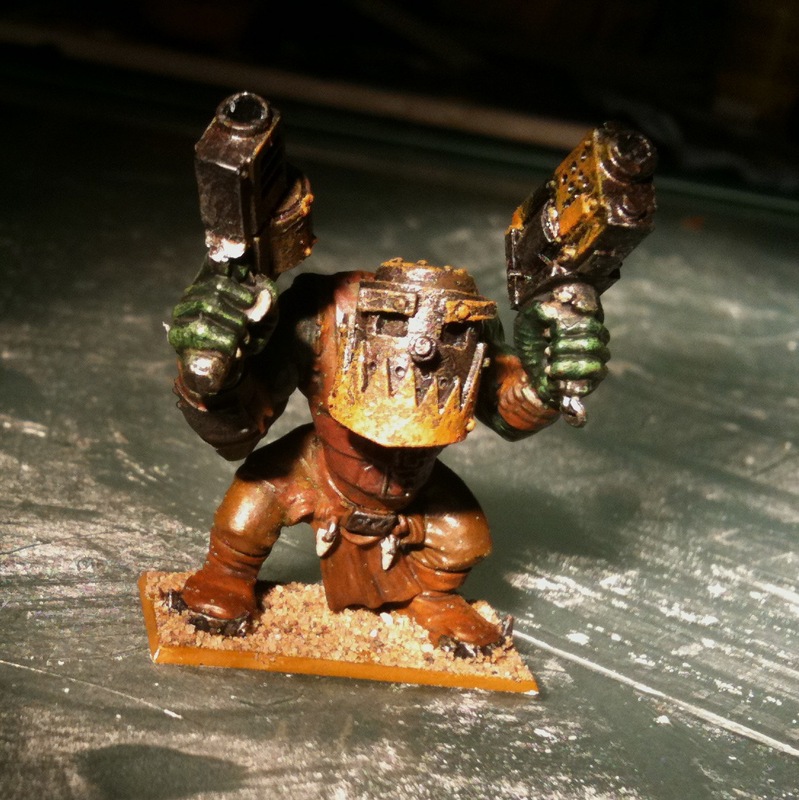 Models painted by Flamekebab and Midnight. 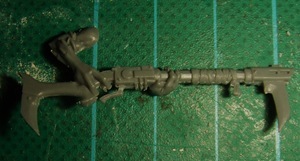 The fourth design is a double-barrelled shotgun as seen below, assembled and painted by sho3box. 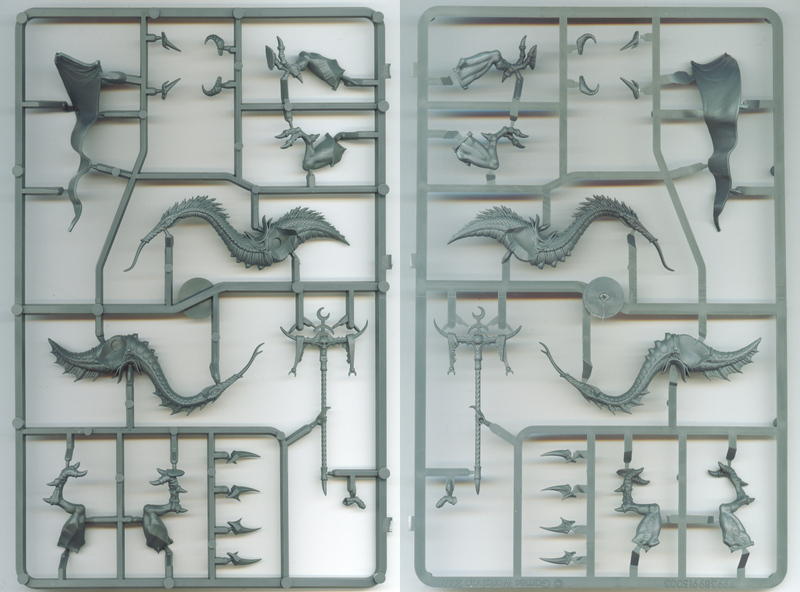 If you want a better look at them in isolation, unpainted take a look here. Oh yeah, where to buy them? Ramshackle games, 4 for £1. 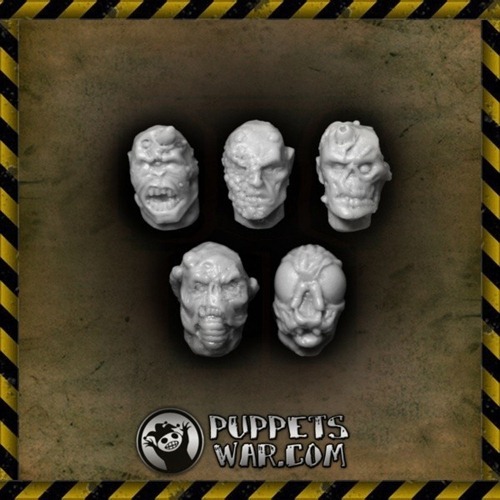 Puppets War have just released some heads that may well be perfect for Muties. They’re about £6 for 10 of them, which isn’t too bad, I’d say. That’s all for now! 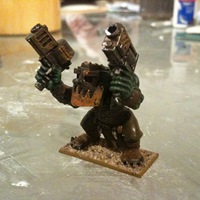 Over on the Waaagh Ryan has got in touch with me to tell me about a new site for awesome looking conversion bits that both myself and Matt feel you should all see, Puppets War. 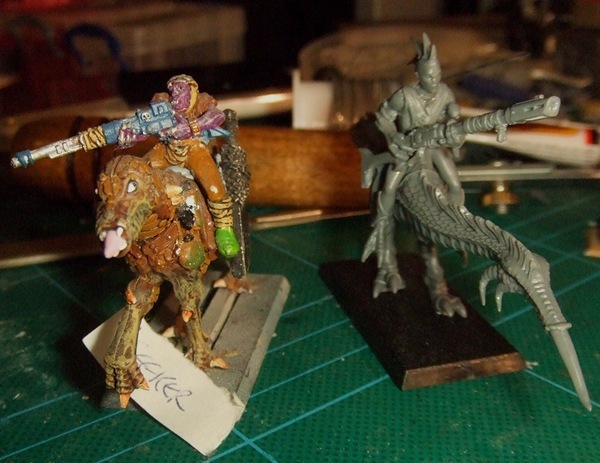 Sculpted by Adrian Gawe, they’re available with and without accessories. 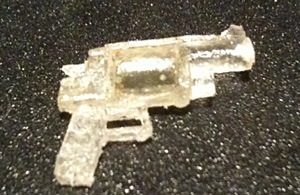 You can even get the accessories on their own if you’re looking for some six-shootas. Next up, Red Army Orcs! I personally think they’re awesome. Apparently there’s more to come too, so keep an eye on their site. 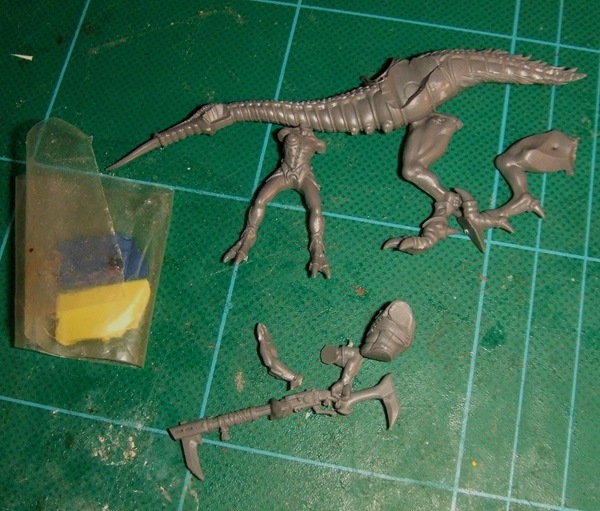 They’ve also got a whole load of different heads for humans and similar, as well as human scaled bionics which might be handy if your Dust Rats get a bit dinged up. I think I’ll see about getting them added to our side bar. That’s all for today. Lots of work on the Feral Orks still to do! Well, no, but a bit more at least. 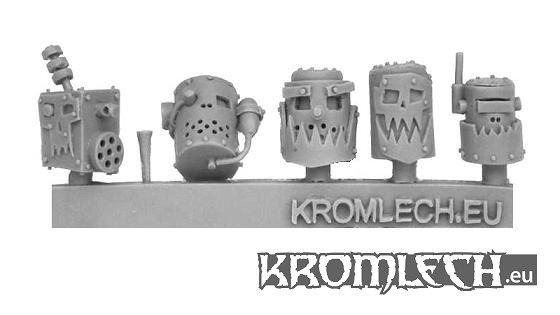 At long last Kromlech have released their Clanking Destroyer heads as a standalone set. better still, there’s two new ones! Quite a few people asked about them when we showed them off in May last year and all we could say was “hopefully they’ll be available eventually”. Well the wait is over, get them here. 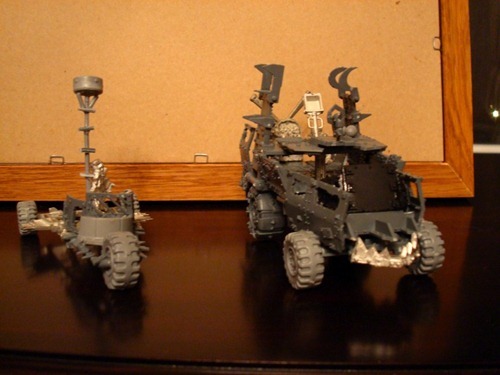 It’s been some time since we had a look at what sort of stuff is available and useful for Gorkamorka. Sure, we mentioned Ramshackle Games a few days ago, but MaxMini and Kromlech have certainly been busy too! We’ve gone through and picked out the things we could find that have recently been released and are relevant. There’s plenty of other stuff that’s been released, but these were the things we felt were most appropriate. 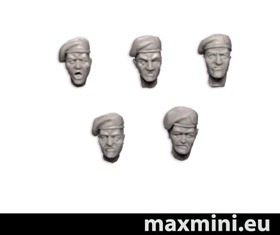 They’re Orc Veterans in helmets and can be had here, we assume they’re be on the MaxMini store eventually. They’ve also done some nice backpacks to accessorise your boyz, but our favourites are the new legs – running legs! Leg replacements and some rather meaty power klaws. Not bad at all! The Stygian ones are only available on the Kromlech eBay shop at the moment, but they are available. 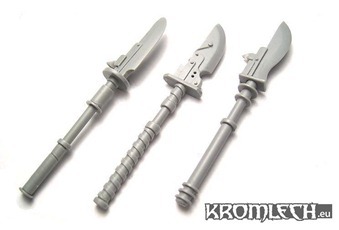 The swords on the left are Post-apocalyptic Rippers while those on the right are Khopesh vibro swords. 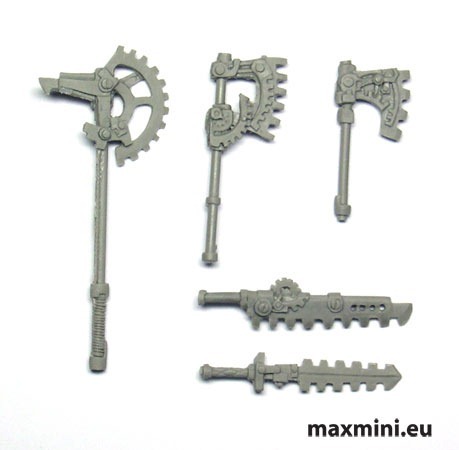 Lastly MaxMini have been releasing some stuff that would be perfect for any Imperial Guard stuff, but also would look great amongst a Dust Rat mob (although not on every model – that’d get a little too uniform). Commando heads – pretty good for Commanding Officers or Veterans, or just for Grunts that would want to give a bit of a professional look to. ANZAC heads – I don’t know about you, but I would think that a hat like that would be ideal of those sunny days on an isolated rock of a planet like Angelis. At last, a way to represent the armour available without looking very Imperial. There you have it. Hopefully we haven’t missed anything. A snorta mob in the wild! While the Snorta mobs article gets a lot of hits we’ve never seen any evidence of anyone actually putting together a mob of them. That doesn’t mean they don’t exist of course, but now we know for sure they’re out there! Are they the first in the world? You tell us! Apparently the campaign in Saskatchewan is going very well, so much so that they might have a campaign restart to accommodate new players. Keep us posted, guys. 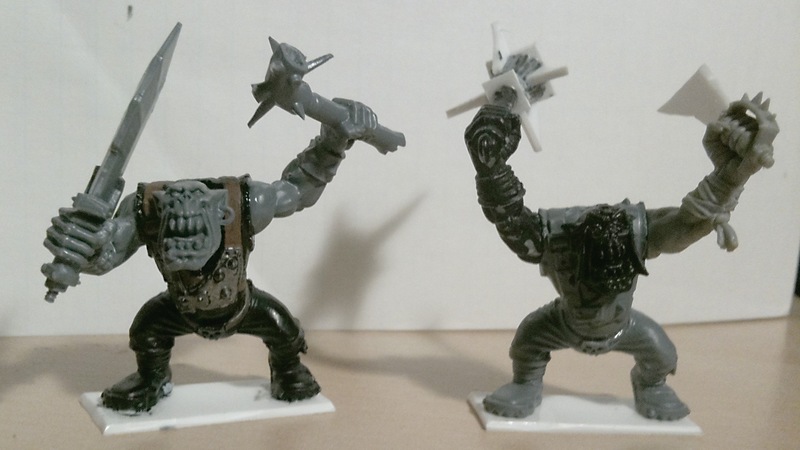 Alternatively there are plenty of boar models available from Games Workshop in their Warhammer Fantasy line, particularly with the release of the Savage Orc Boar Boyz recently. sho3box has pointed out something quite interesting – there’s now a figure available that is ideal as Da Krusher. 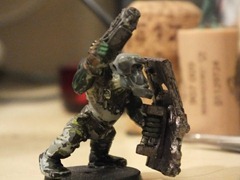 Ramshackle Games’ Gorillagon, sculpted by Electromancer. There’s been plenty of other attempts at creating a model for Da Krusher, as no official one was ever produced, but this is the first affordable turn-key solution (the model costs £2.50!). I’m told they’ll be available in a few weeks, but we’ll keep you posted. We’re back from our festive down time and have various things we’ve been working on over the holiday period. Lots of them aren’t quite done yet, but needless to say you’ll see them soon enough. 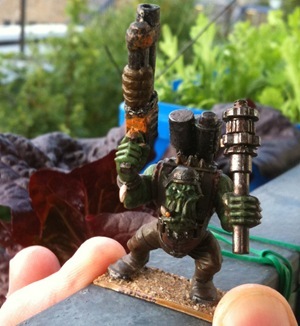 In the meantime check out these rather cool trash bases. Ideal for scrap counters we reckon. Thanks to Jamie Heath over at Vague Connections for that tip! They’re pretty awesome, we think you’ll agree! 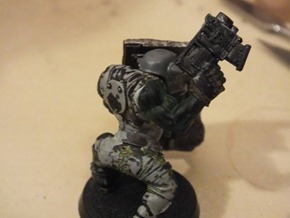 There are a few additions to the model, like the Space Marine scope (which dates back to 1998, a gift from Laurence K, back in the old country!) 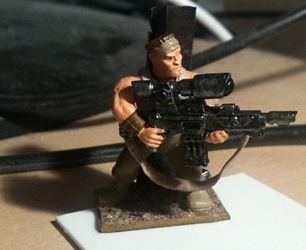 and a few accessories from some Space Marine Scouts. The goggles are made from green stuff. For those of you who are interested Kromlech have opened a store on eBay so you can buy directly from them if you so choose. There’s also talk of some more Orc War II stuff. They’re not available yet, but they look pretty awesome and apparently there’s further nifty stuff to come. They were sculpted by Filin, by the way, credit where it’s due. Building Muties is now surprisingly easy and at last, cheap. Back in August Games Workshop released their new plastic Seekers of Slaanesh which paved the way for this kitbash. The riders in the kit are fine from the waist down, but above that they get a little, uh, odd. 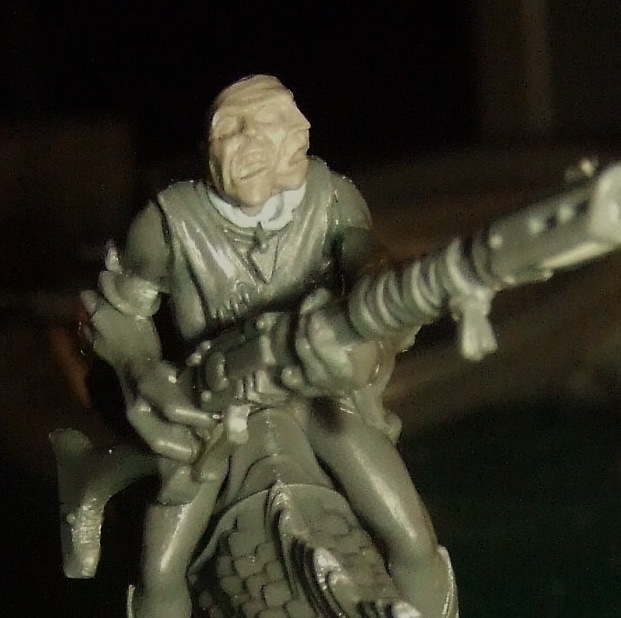 To deal with this issue I got hold of some Kroot parts from Bits And Kits (you could buy the boxed set, but if you just want a few as I did, this is significantly cheaper) – torsos, rifles, and a few accessories and heads. I feel a little condescending putting this tutorial together as it’s incredibly easy, but I’ve not seen anyone else write anything up, so here goes! Then there’s the head. This is really personal preference and there are so many options, I’ve seen zombie heads, human heads, mutated heads, and a number of others. If you don’t have one that is perfect, you can always use some green stuff (kneadatite) to create a hood like the one CauCaSus made. Pick one of the mounts, they’re all slightly different, assemble it as normal. If you plan on adding reins, don’t attach the spikes/horns on the head. 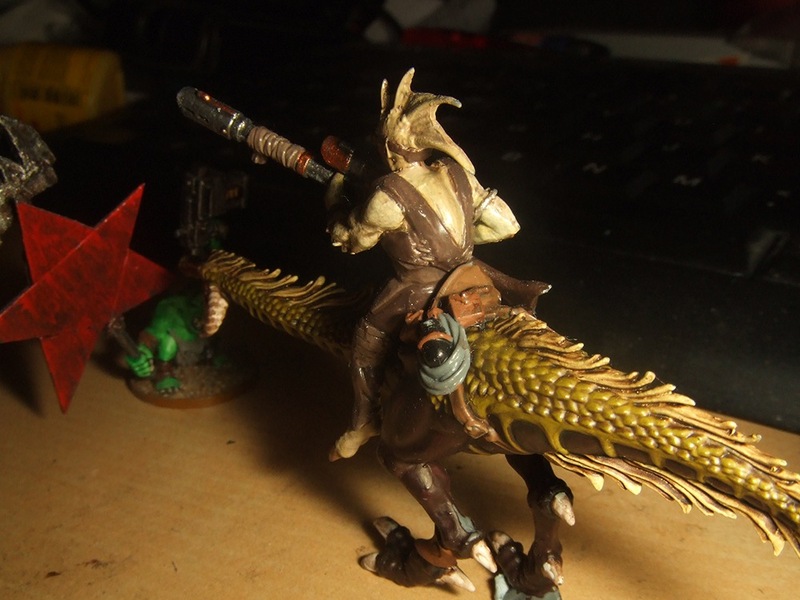 I was originally going to add some using green stuff but Midnight informed me that Native Americans rode without them and it’s quite feasible for a skilled horseman – seems appropriate for the Muties, especially to keep their hands free to fight! As you can see, the mount itself is about the same height as a normal (based) Ork. The rider’s body should be cut around the waist, near the thickest part – a knife or razor saw will do the job in seconds. 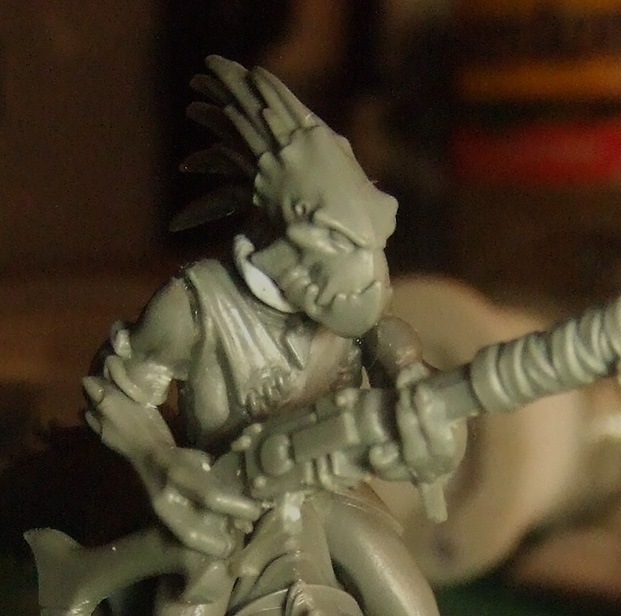 Next is the Kroot torso – you can use it as it is, but when I blu-tacked it together it looked a little oddly proportioned next to a human model. 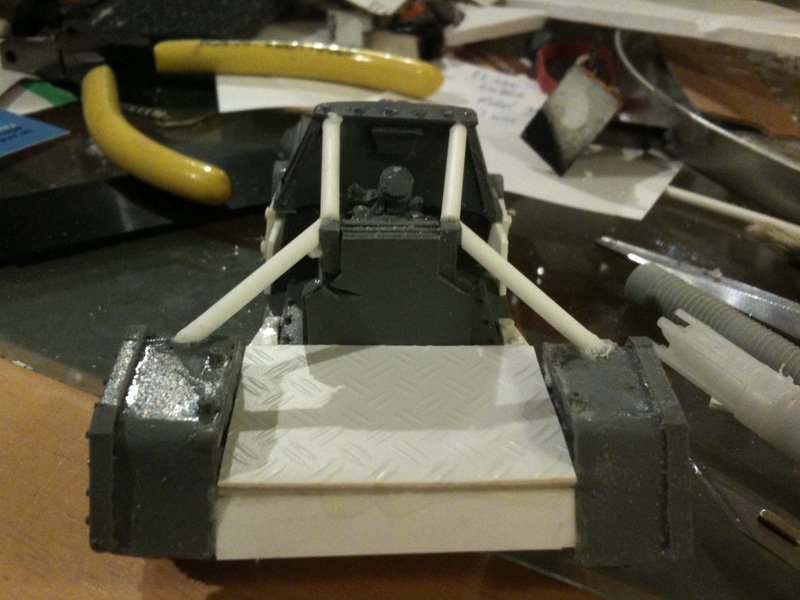 Cut between the chest/belly panels and trim the edges to be relatively rounded. A bit of trimming work is required to get the two to fit evenly but it shouldn’t take long. 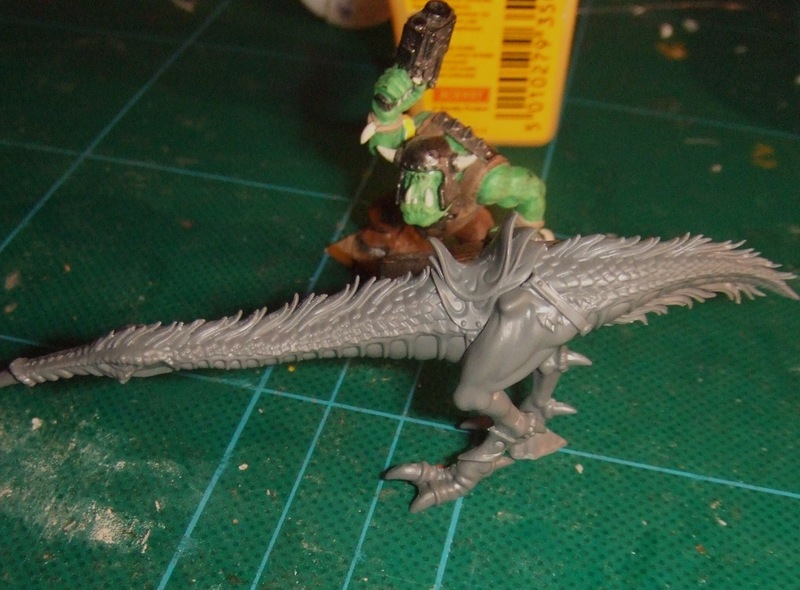 The two can then be glued together, although you should test them on the mount first as the torso extends out a little and will clip the saddle if you’re not careful. 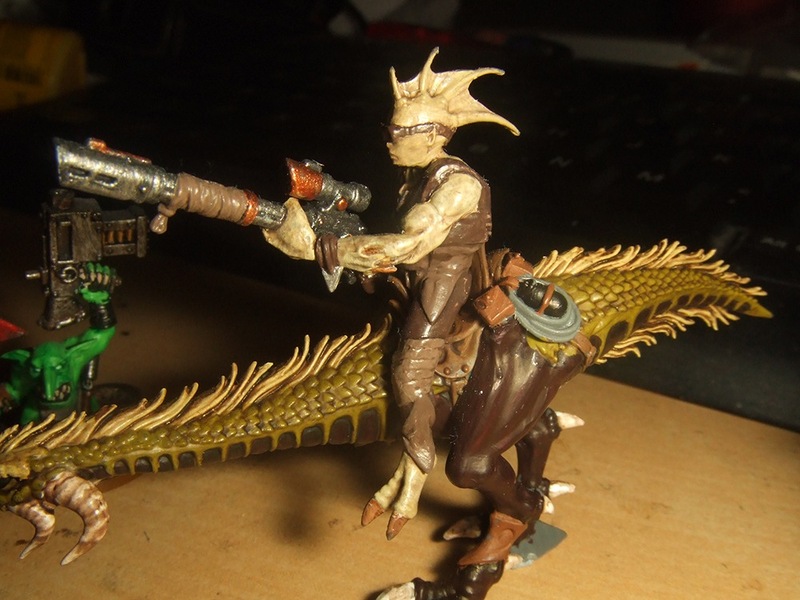 The Kroot rifle is pretty awesome, but the blades seem a bit much to me. I snipped off the front blade and rounded the back one into a stock instead. You could modify or replace the weapon, of course, but that’s up to you. This step gave me a bit of trouble as I’ve got so many different ones lying around. 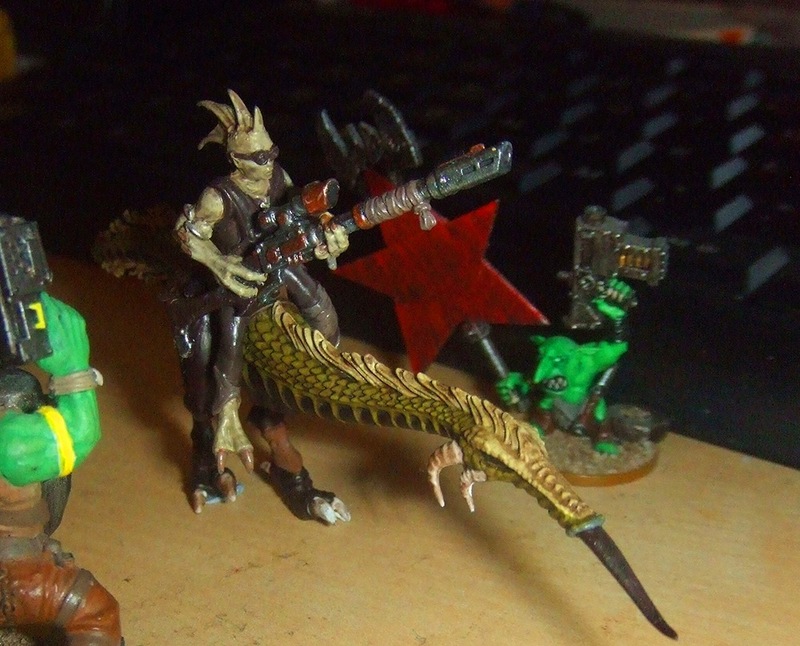 The Tau were released recently relative to how long I’ve been in the hobby so I don’t really recognise their heads and so I considered just using the Kroot head, but that seems wrong given the rest of the top half is Kroot. 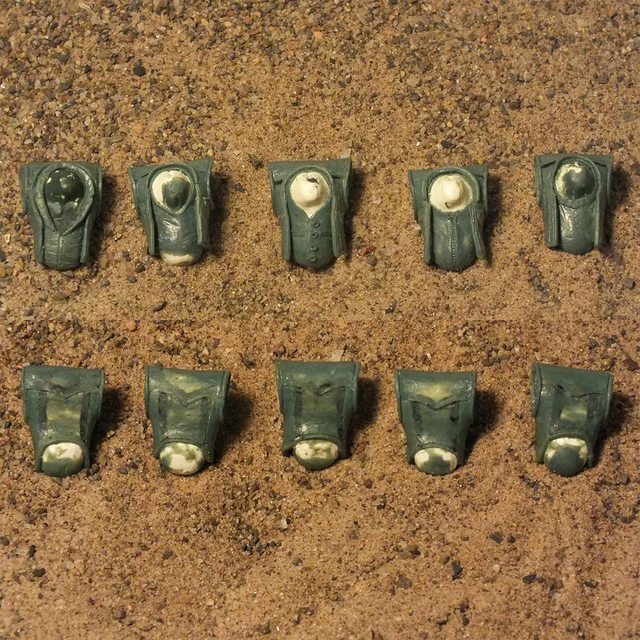 I have a few heads from MaxMini’s mutation pack, but after trying them out I think I’m going to save them until a head replacement is required from visiting Da Green Pitz. Eventually I decided to use one of the heads from the Seekers of Slaanesh set, one with a Mohican fringe thingy. 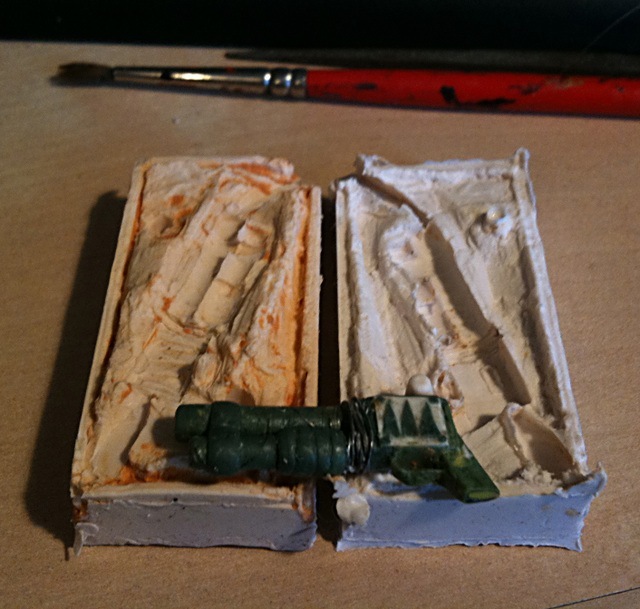 As the head is a bit small I carved away some of the neck and shoulders of the torso and filled in the head socket with some scrap plastic. In those photos you can see I’ve also added the horns to the steed’s head, having decided against reins earlier. 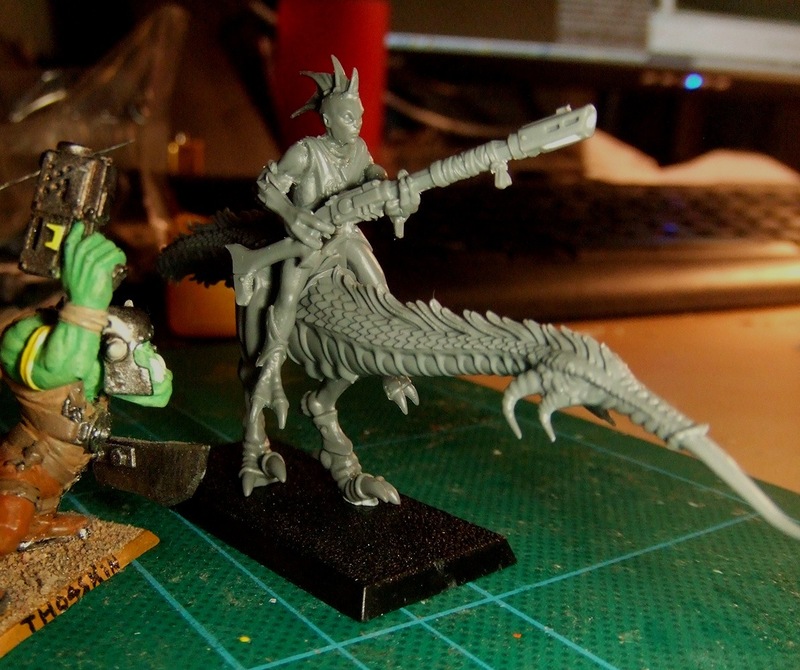 This kitbash is very simple but should serve as a decent basis for more complex conversions. If I put together a whole mob like this I’ll be adding different features – saddle bags, different weaponry, robes, etc..
Once this model gets painted up, I’ll probably post photos. For now it’s on the backburner whilst I finish up some Dust Rat vehicles, but it could be fun to paint, so I’m rather looking forward to it! …and with that, Mutie Week draws to a close. Next week is User Contribution Week! 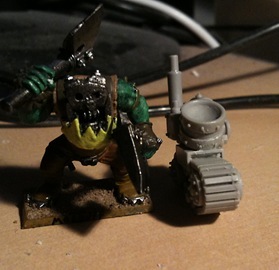 I recently got hold of a large number of second-hand Gorkamorka models, a find I am still very pleased with. 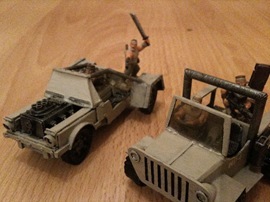 However, in the majority of cases, second hand models are painted. Sometimes the paintjobs are excellent, other times atrocious. 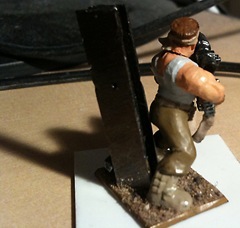 However, I prefer to paint my own miniatures, so I usually strip them. There’s a variety of different ways to strip paint, but my preference is Dettol. It’s not too expensive and doesn’t take very long. It also works on both plastic and metal, which is more than can be said for lots of the other methods I’ve heard of. Brake fluid, for example, apparently takes a week or two to strip the models. Seriously? A few days is too slow in my view. Thankfully Dettol strips the paint in a matter of hours. There are a few caveats – Dettol will not dissolve superglue, which may prevent paint coming off in some areas. Remove the superglue and then try again. 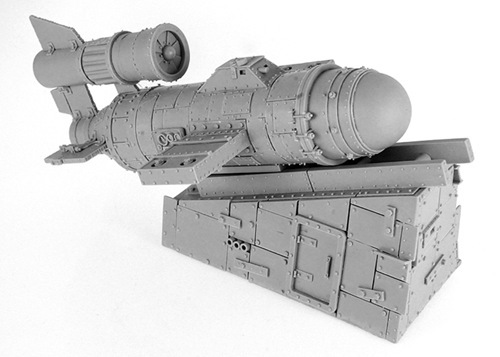 This may well be a non-issue if the models were assembled then painted, but it does come up. The Rebel Grots in the photo were left in nail varnish remover for a few days as an experiment – it removed some of the paint, but wasn’t particularly effective. So, they’re going in the Dettol! For individual figures and components I use jars, for vehicles I use ice cream tubs. Fill the jar as much or as little as you like with pieces. 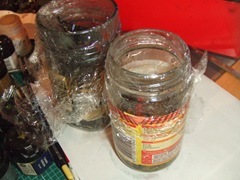 In the photo the larger jar is for metal vehicle components (there’s most of a Big Lugga in there, for example). Once you’ve got the stuff you’d like in the jar, cover it in undiluted Dettol. It doesn’t need to be immersed to any great depth, just enough to cover the bits will be fine. Cover the top with clingfilm (“Plastic wrap”) and leave overnight. Or for a few hours, really. You’ll be able to see the paint coming off, so it’s easy to gauge how things are going. The next bit isn’t essential, but given that Dettol is kinda poisonous, it’s probably best to be careful. I wear gloves when dealing with the models and for preference a gas mask, but as long as you’re in a reasonably well ventilated area you should be okay, just don’t treat it like a sauna. If you do get a little Dettol on you don’t worry, the problem comes when your fingers spend several minutes covered in the stuff. You’ll get numb and your skin will prune. Then it’ll stay that way for a few days, which gets pretty tiresome I can tell you. 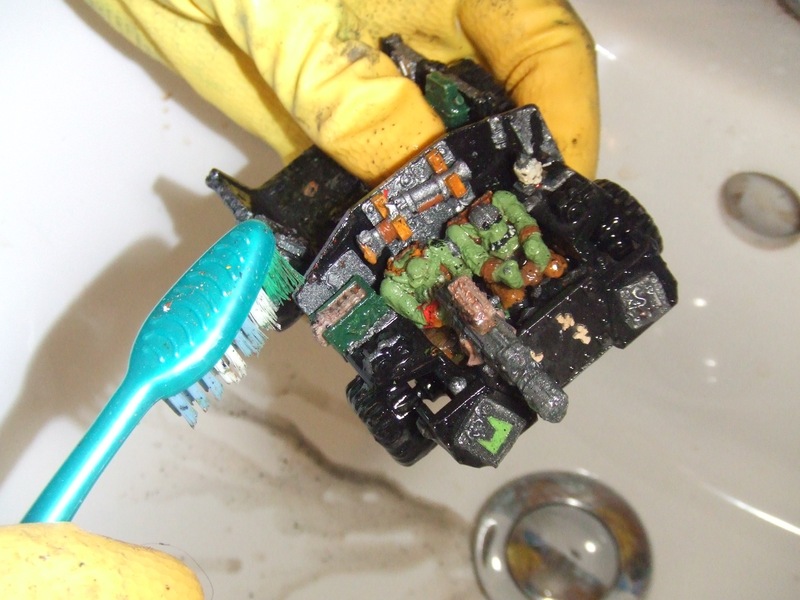 As there’s going to be bits of paint everywhere, I recommend you strip the models over a sink or bathtub, something that is easy to wipe down. The stuff gets everywhere, so a sink is ideal. Fish out one of the models in the solution and grab an old toothbrush. 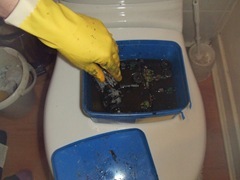 Holding it in the sink, gently scrub at the model. The paint should come away in stringy, sticky chunks. It’s a little hard to describe, but you’ll see what I mean when you try it. Most of the paint should come away easily. If it doesn’t, put the model to one side and continue on. 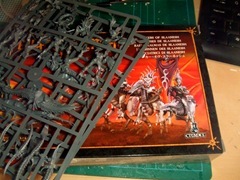 You can then stick the models that weren’t stripped enough in the jar for a second round of stripping. It’s worth mentioning that you can reuse the same Dettol for this. Once you’re certain you’re done scrubbing at the models, rinse them in warm water. You can scrub at them as you do this, if you feel they need it. 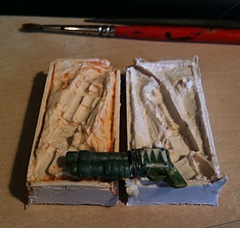 However don’t use the same toothbrush to scrub at them during this as the paint flecks will stick to the model. Leave the models to dry somewhere and they should be ready to paint. Those that didn’t get fully stripped should be put through this process again, perhaps with a fresh toothbrush. I bought a big pack of them at a rather tatty discount shop for this very purpose. As you can see, the result isn’t too bad and the plastic isn’t warped. I’ve got a whole load more to strip, so I’m going to get back to work! As you probably know, we’re big fans of Ramshackle Games here at tUGS and we’ve just noticed that they’ve released something new that might be of interest to our fellow GoMo players. As there’s no date on their new releases page we can’t tell you how long it’s been out, but it can’t have been more than a week or two. Either way, we think it looks rather good and would look great on the board alongside any other vehicles. 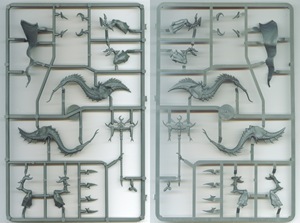 It’s a multipart kit made entirely from resin and the individual parts are available separately if you don’t want the whole model. 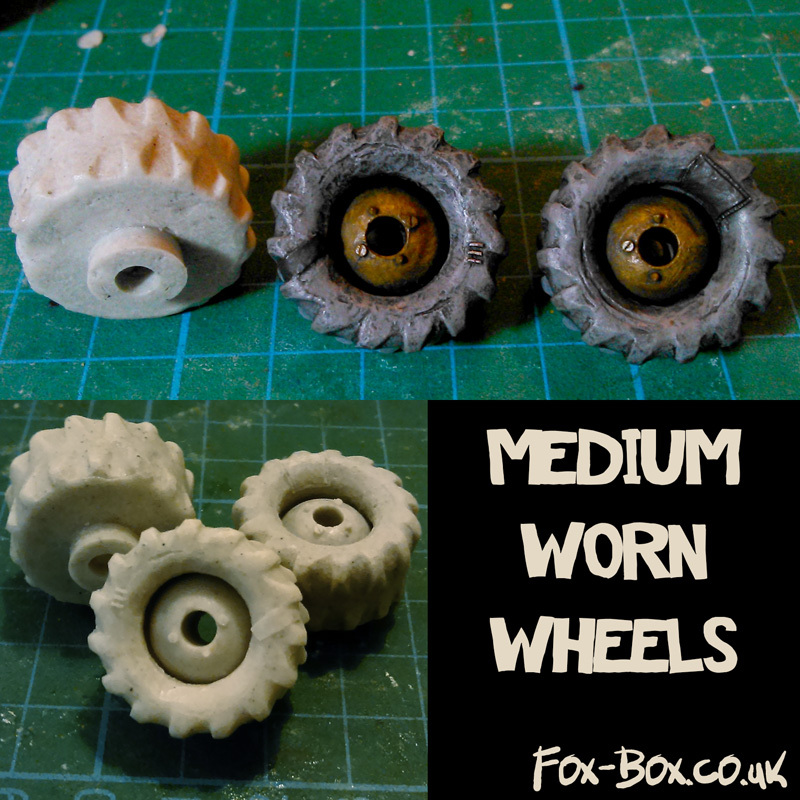 If you need a decent set of wheels for a scratch-build you can find the wheels used on the pickup truck here. It’ll set you back £10, half the cost of a modern Ork trukk, which isn’t bad. Have a look around their site as they do a lot of other awesome stuff. 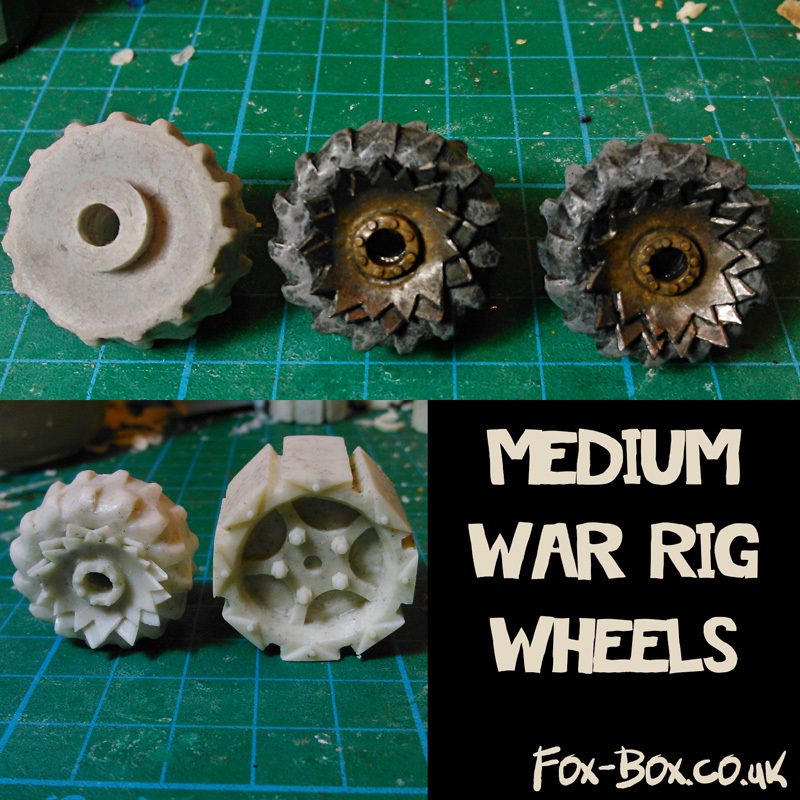 Our playtesting vehicles for the Dust Rats use a lot of their parts for example (Speaking of those, another one is due to be unveiled as soon as Flamekebab has finished painting it). The images in this article are taken from the Ramshackle Games site but are used with permission. Thanks, Curtis! Holee crap these are awesome! Seeing anything like this coming over the horizon towards me, I would simply lay down my rifle, curl into a ball and wait for the rush of death to sweep over me..
Make sure you check out the rest of the pics in there, though if you have a slow connection, it might be quicker to wait for them to break the atmosphere and begin scouring this world of life. 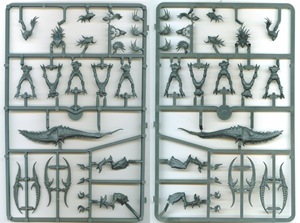 Around the 8th August the new Games Workshop plastic Seekers of Slaanesh were released heralding a simpler life for Mutie players. 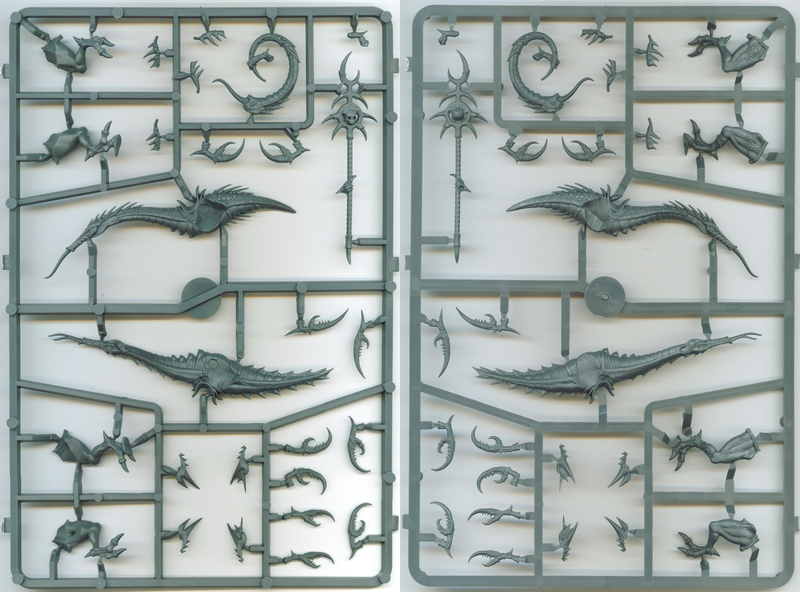 I ordered a set over at Maelstrom games (£13.50), giving me five of these multi-part beauties. I’ve scanned them in so you can get a detailed look at what’s in the new box. A word of warning, each of the images is about 4MB, irrelevant to many, but could be annoying if your connection is a bit slow. I don’t thing there are any legal problems with me posting images of these unboxed, but if there are I am quite willing to take them down. As you can see, they’re pretty detailed. They’re also virtually dead-on the size of the old Muties. They’re not perfect for the job as you’ll probably need do swap some heads and some torsos, but the basis is good, particularly if you’re a dab hand with greenstuff. I’m not going to assemble them just yet as I’ve got quite a lot of other stuff on the modelling table at the moment, notably the Dust Rat’s heavy vehicle, the SSV. 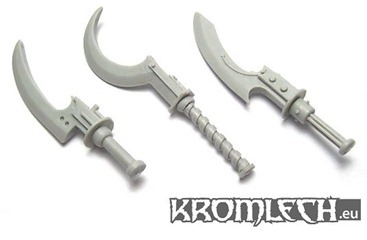 I think I’m going to try to get hold of some Kroot pieces to combine with this set, using some of the ideas from this forum thread. Anyway, anyone looking to start a Mutie mob, your quest just got easier! 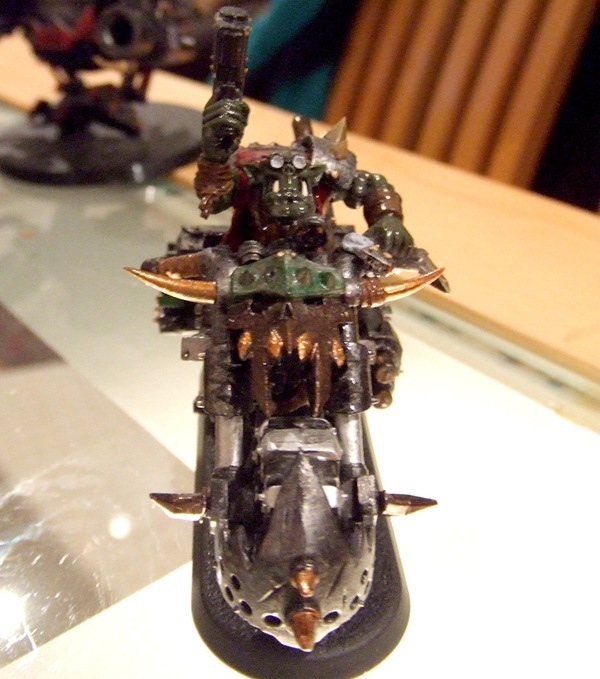 One of the tUGS crew has painted up a few of her models to sell on eBay and has just put up the first two items – a Killa Kan, and an Ork warbike. Our apologies if we sound like shills here, we’re just trying to help out one of our friends who has contributed a lot of time and support to the site. 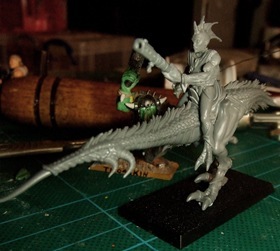 She’s got a mob of Gretchin (with a Slaver) that I think is going to go up in the next few days and possibly a few more Kanz and bikes. 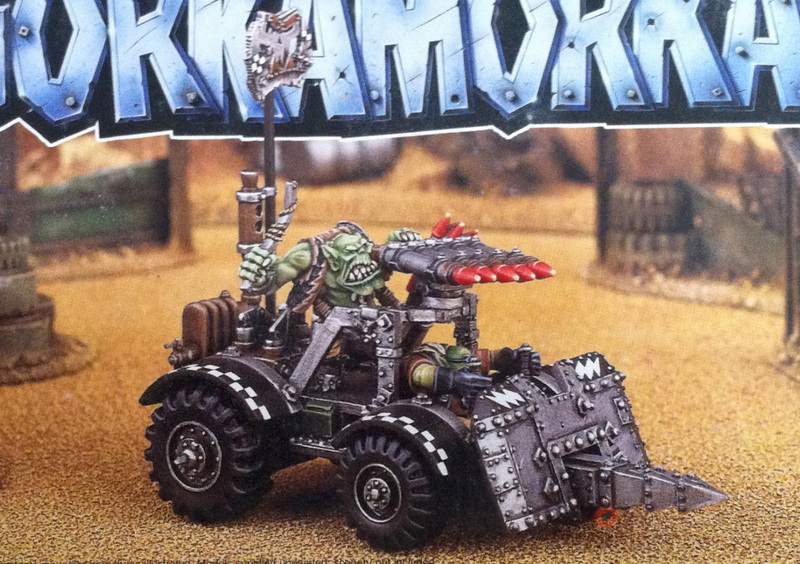 Of the two my favourite is probably the Killa Kan, although the warbike is pretty awesome looking too. Anyway, that’s all for now and with any luck we’ll have some fancy material to go on the site soon (most of the work we’ve been doing lately has been for Ere Be Stuff which has been keeping us busy). I happened to be inside an actual Games-Workshop establishment a while back, on the eve of the release of the new edition of the Fantasy rules (Is it Fifth Edition now? 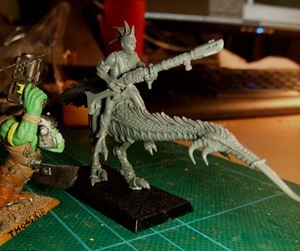 I’ve lost track) and my true purpose was to find some Cold Ones from the Lizardmen to see if they were anywhere near suitable for conversion into the kind of Muties that I like, that is, still vaguely similar to the previously released editions. Alas, I found the Cold Ones not to my taste. 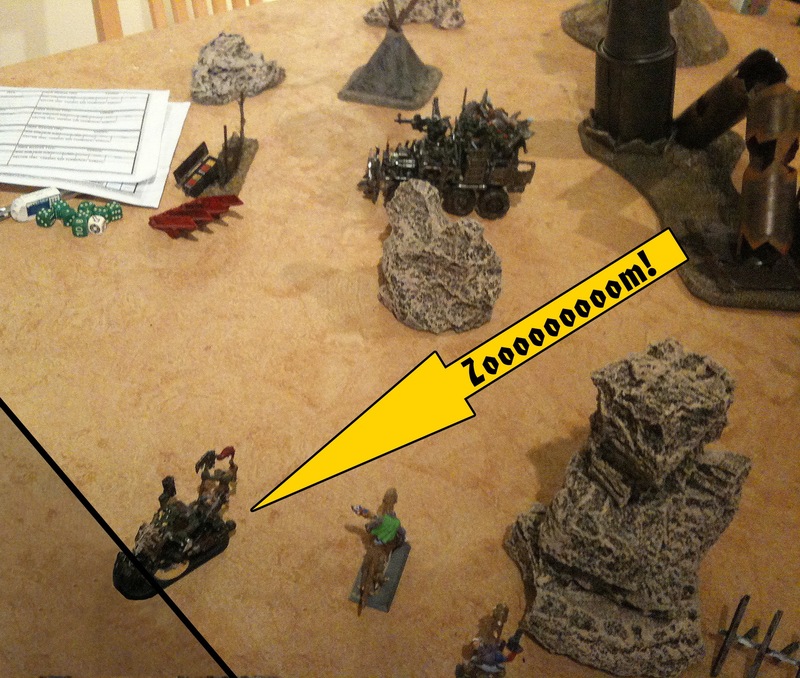 Then the gentlemen of GW looked around furtively and pulled out their advance copy of the new rules and thumbed through it to the Chaos section. And they showed me these lovely ladies. 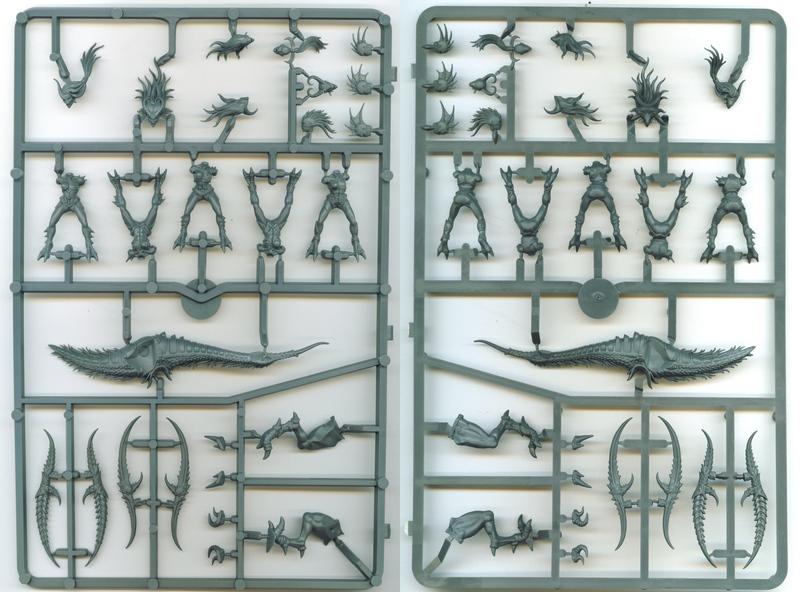 These are of course plastic models and come in boxes of 5 for a fairly reasonable sum of £15 sterling. 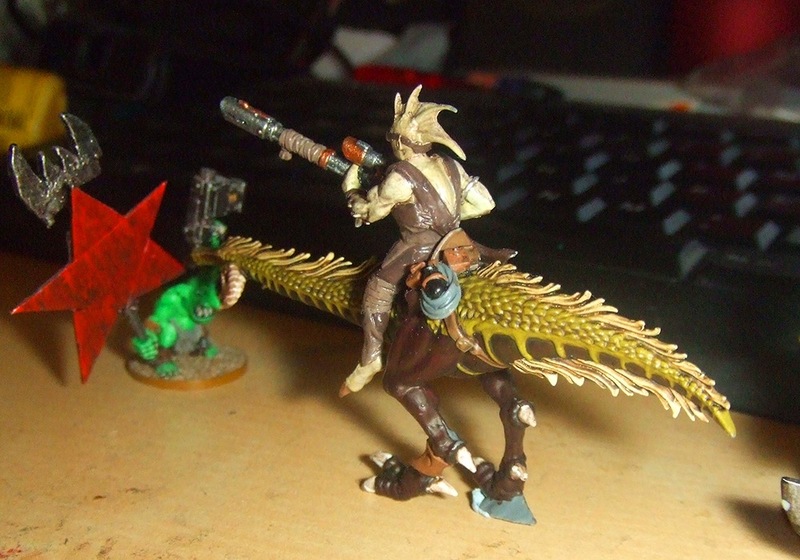 While the mounts are two legged instead of the four legged horses available originally, I felt they would convert very well into desert traversing beasts. 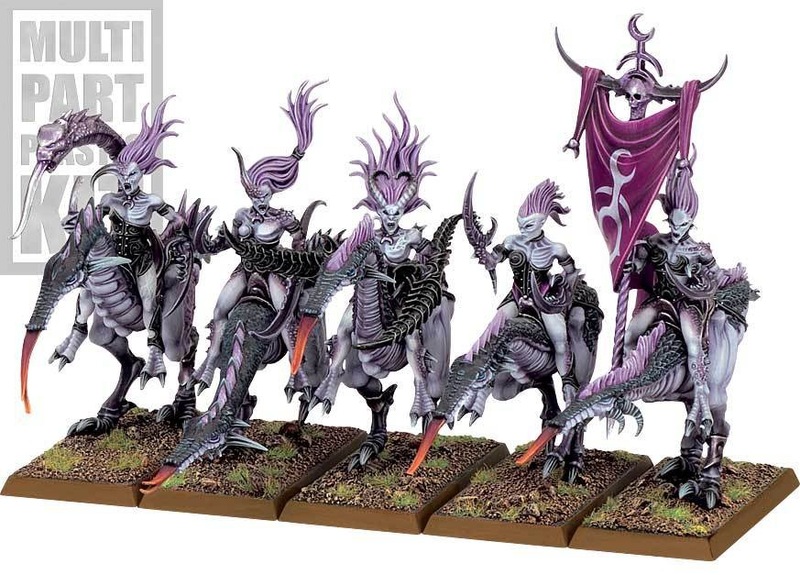 They’re due for release on the 7th August and I feel represent what could actually be the basis of an entire Mutie mob, given that the warriors cost a fair bit. 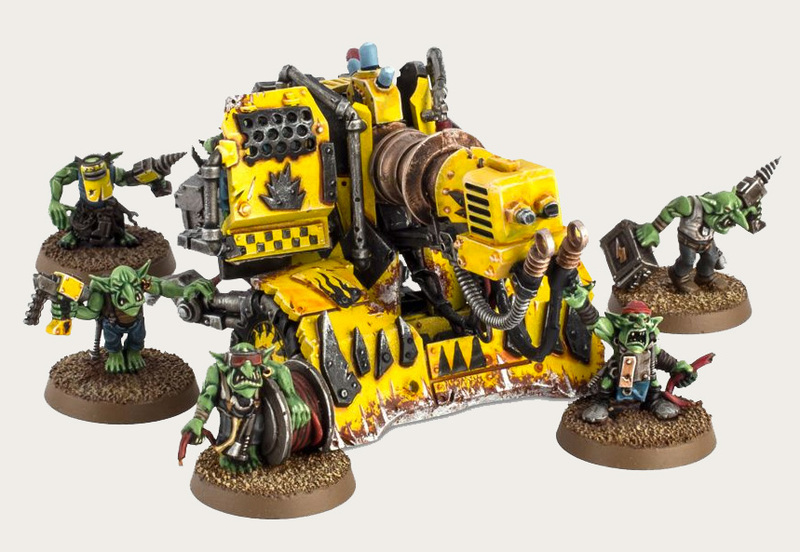 My current mob, while powerful, still only has five member and I think this is the ideal box for folks who feel like getting a bit weird in their Gorkamorka mobsters. Of course, these models lack the necessary firearms to be a true Mutie mob, though I have to say, there are some wonderful claws that fit the nice Scything Blade mutation available in the soon to be released “Da Green Pitz”. While the actual upper bodies probably won’t be used, instead being built out of Green Stuff, I’m definitely grabbing a pack of these to have my surgical team turn into some real freaks. I wonder if we know a certain Dok who has a penchant for making tiny, wonderful firearms? Possibly coupled with a nifty annual Flamekebab came across, we’re looking into outfitting this new band of Muties with some serious new hardware. Oh, I’m Mattz by the by. Resident Mutie player and one of the folks working on turning ‘Ere Be Stuff into reality. Pleasure to meet you all proper. 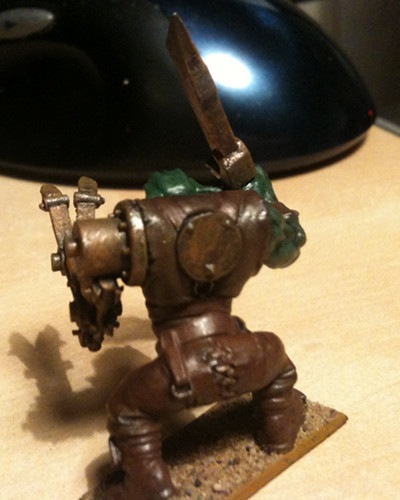 Image is property of Games Workshop. 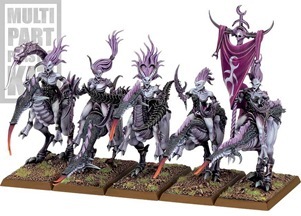 Seekers of Slaanesh are currently found on the website under the Warhammer Advance Orders section. All of Grimlug’s Lads are now painted and based (where appropriate) and so I present the second of two Orks using the Kromlech Orc War II heads, Skrognik. 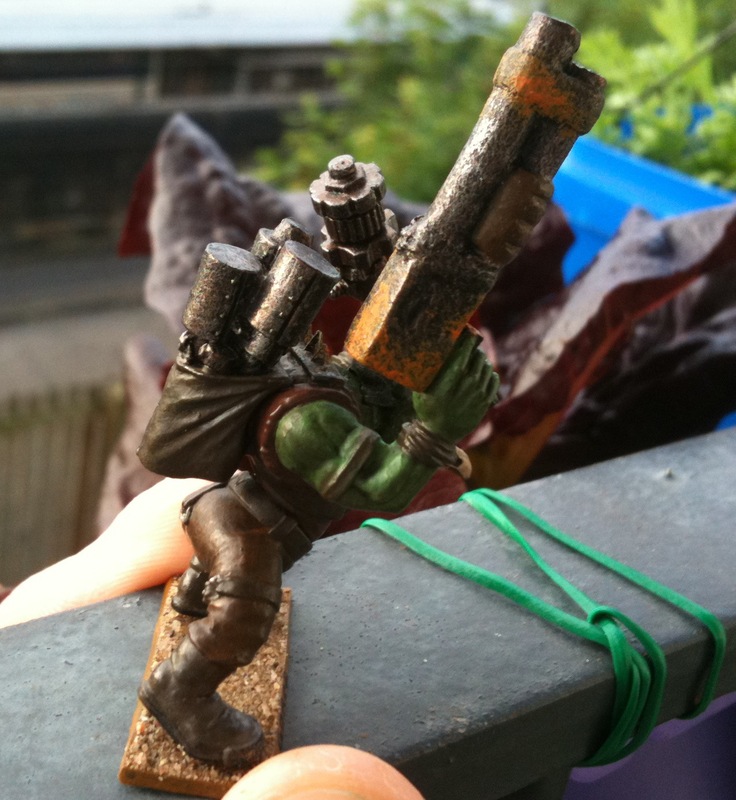 He uses a 40K Ork biker arm and carries an old metal choppa on his back (Gorkamorka weapon sprue). 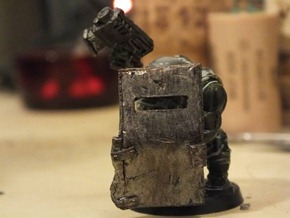 It’s attached using a small section of plasticard tubing and is probably removable without damaging the model, uh, probably..
Once again I used grey_death’s rust painting technique, as seen on all of Grimlug’s mob. 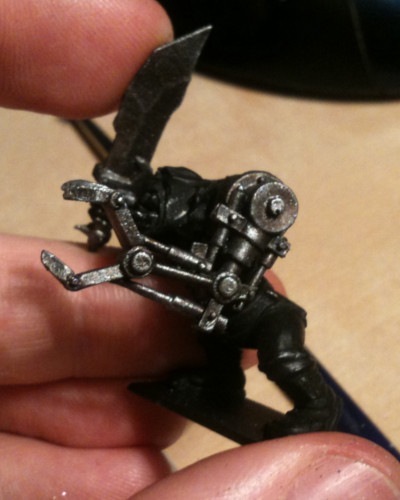 His right hand was done through very careful scalpel work and a little bit of cutting and gluing. I rather like the result and feel it is entirely appropriate for an overly cocky Ork yoof! It’s finally time for the first component of Ere Be Stuff to be released – Burnas! Yes, yes, we’ve released Matt’s Mutie healing rules as a preview release, but they’re still being worked on, tweaked, illustrated and updated. Given the Orks’ penchant for fire in all its incarnations it’s a little surprising that dedicated burna rules were never released but now they have been! Previously fire and burnination was limited to scorchers and the odd splattapult payload but we here at tUGS felt that something as delightfully destructive as fire should appear more often. 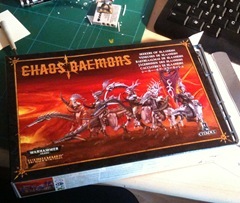 That and there’s been so many great models for them released! Primarily written by Benjamin Fox (tUGS’s very own Flamekebab) but with significant contributions by the whole team, this release sees the first public appearance of Clayton’s artwork for the project. I’m sure you’ll be as impressed with his artwork as we all have been. You can see more over at his DeviantArt page. 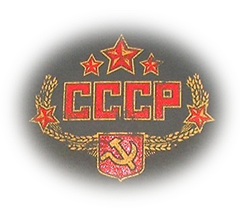 Edit: A new PDF has been created using the more modern template. This document was written by Benjamin Fox and contains artwork created by Clayton Tait. It’s licensed under a Creative Commons Attribution-Non-Commercial-Share-Alike license. Only a few members of Grimlug’s Lads are currently unfinished. Today Gorog finally stepped out, ready to face all comers. Armed with a rusty kannon (cast in resin from this mould), a club (from an Ork biker) and a backpack of krak stikkbombs, this Gorker is not to be trifled with. Did I mention he has a WS of 5? Other than the use of a custom cast resin weapon, this warrior is special because of his head. 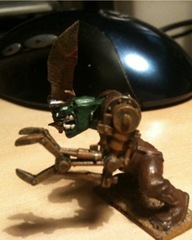 He’s built using a head from Kromlech’s Orc War II head pack. 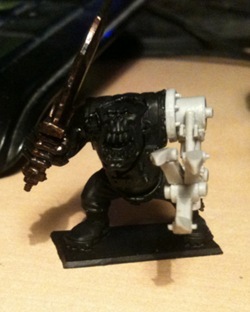 As you can see these heads fit perfectly on modern 40K Orks and suit the style rather well to boot. For those interested to see more of these heads in action, you’ll be glad to hear that another model using one is nearly finished. Hopefully photos of him will be available in a few days. 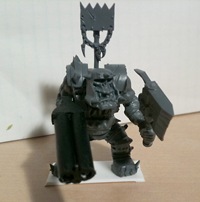 One of Grimlug’s Lads received some head trauma that was more severe than usual recently and ended up with a headwound making him relatively unreliable in combat. 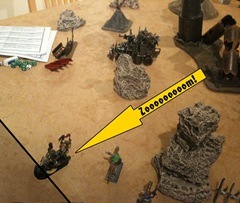 Not prepared to lose out on a mob member, Grimlug forced him into serjery and the result was truly unpleasant, so much so that young Wazbag now causes fear. Wazbag can be seen here sporting his new iron mask and there’s probably some joke that could be made here about the ork in da iron mask, but it’s a little contrived. 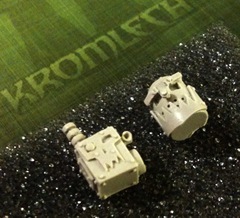 The head is from Kromlech, it’s one of the three heads available in the Clanking Destroyers sets. You might have seen them on here back in May, there’s two other designs in addition to this rather fetching little number. 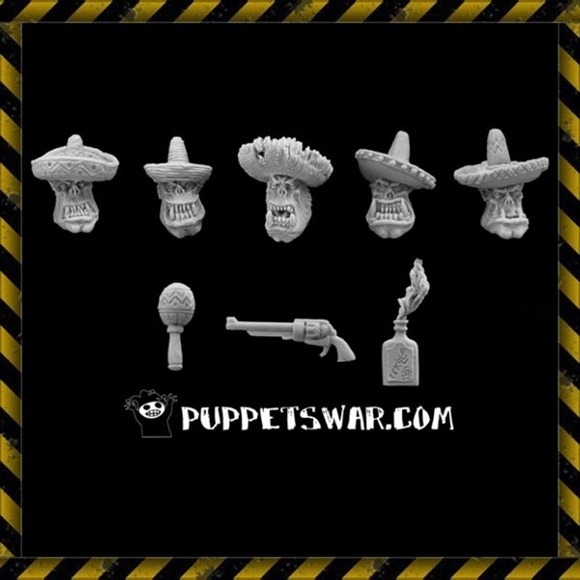 Currently there’s no word on whether these heads are going to be released separately but it seems several people have requested them so perhaps there’s hope. Those lads over at Kromlech have been at it again; remember the first gyro-stabilised monowheel that we showed you a while ago? Turns out it was part of a set! You’ve seen the middle one before, but the other two are new and raise the bar even higher. These were all done by Hamster_52 – damn fine work. 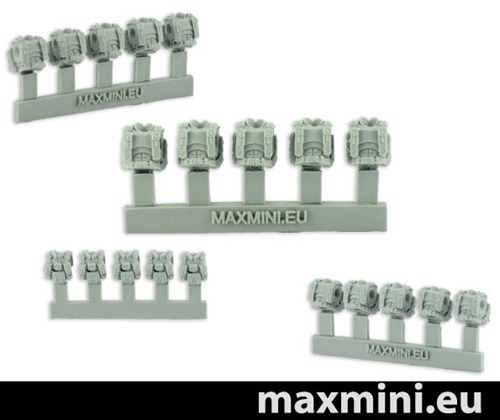 They’re currently not on the MaxMini store but we’ll let you know when they are, currently the word is that we can expect them in July. 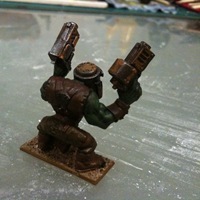 We’re still working our way through our first batch of bioniks but when they’re available we’ll have some for you to see them in action, recently one of Da Not So N00bz found himself the proud owner of a Kustom Thruster Booster. Expect a painted version of that some time soon. 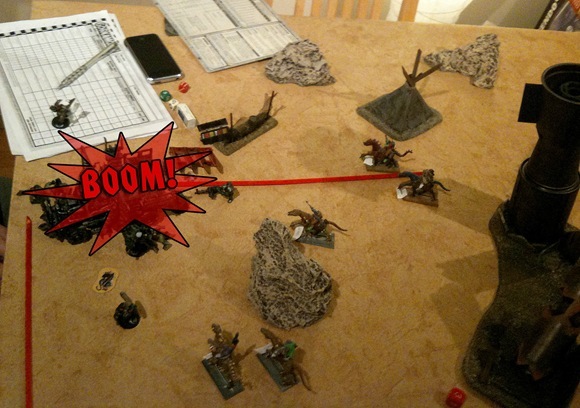 In April we had our last playtesting session for the Dust Rats, our new GoMo faction, but since then we’ve not said much. However, that shouldn’t be taken to mean that there’s been nothing going on, quite the opposite actually. We’re not going to discuss the latest things with the rules right now, although we plan on having another playtesting session soon, instead this post is concerning the Dust Rats’ Light Recon Vehicle (LRV for short), the vehicle of choice for our first Dust Rat mob, Whiskey Delta 4. LRVs, or "Recces", are weakly armoured wheeled vehicles used primarily for their manoeuvrability. Usually able to carry four to six Dust Rat warriors, these small trucks are excellent for quickly recovering scrap from the desert due to their light weight, unfortunately this does mean they are highly vulnerable to both enemy fire and ramming. 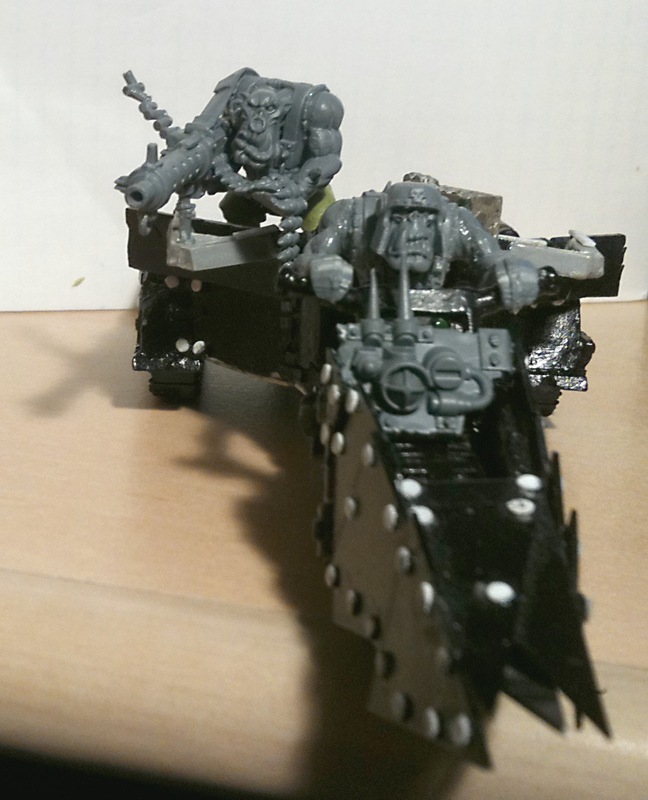 They’re not nearly as tough as Ork vehicles and don’t provide much protection for the crew which is precisely what we want. They’re also significantly smaller, with the number of warriors suggested in the flavour text. 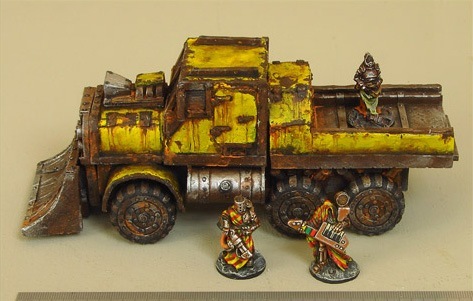 We’re not trying to stop you putting ten warriors on one with rules, but rather try to encourage players to treat the vehicle as a small transport, different from the SSV. These two aren’t supposed to be the definitive interpretation of LRVs, but more a baseline for what kind of thing players should think of when they read that someone’s mob has one. The small one is supposed to be about average whilst the larger one is a sort of upper limit on size. As long as the models are based appropriately, as all GoMo models should be, it’s easily possible to fit four models on the back of the smaller of the two LRVs. 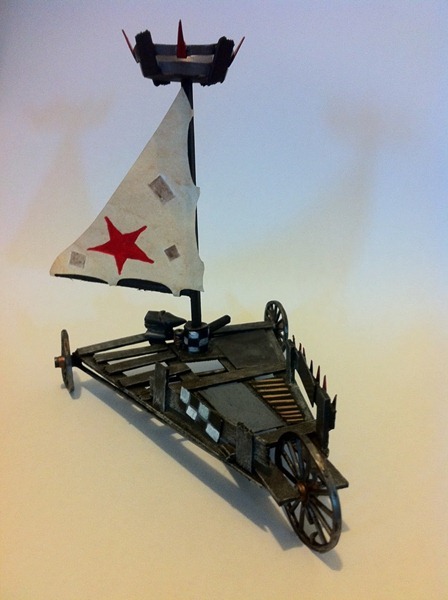 The next Dust Rat vehicle will probably be the Dust Rats’ bike (based on this model from Ramshackle Games). 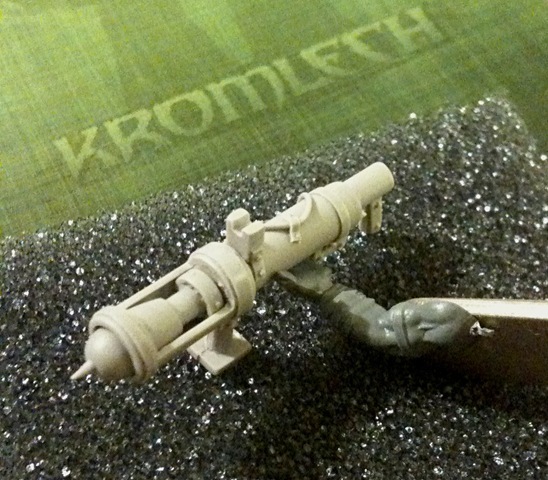 There was one last thing we wanted to share with you from the special package from Kromlech and that is their Orc War II PIAT anti-tank launcher and its accompanying rocket. You might have seen it in the image they released of their weapons pack, but we can’t show you the rest of the weapons as we don’t have any yet. From this piece it’s looking like they’ll be pretty good though! 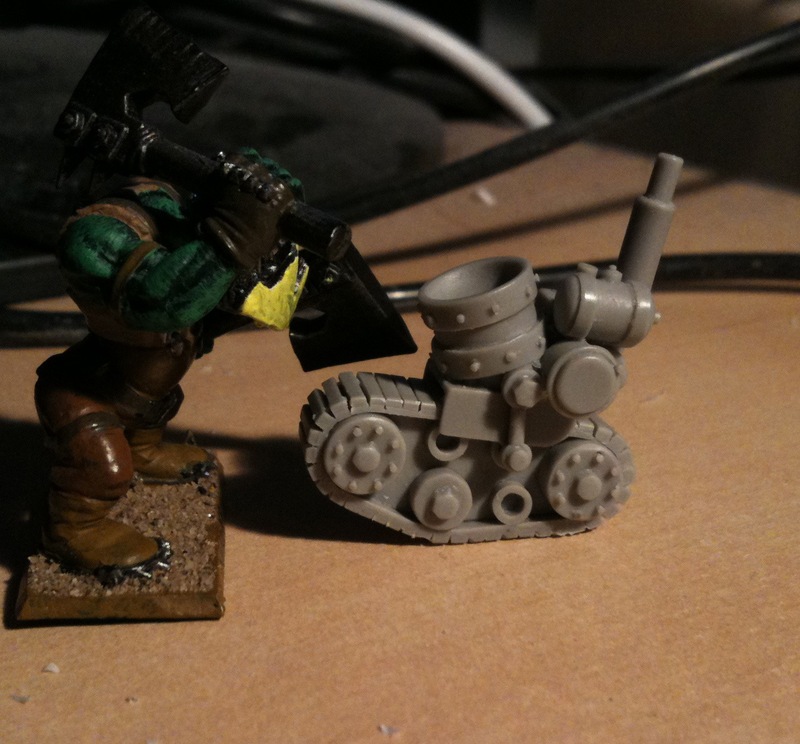 In the photo below you can see how big the launcher is compared to the standard Ork Boy arm holding it. It looks like a great piece for a unit of tank busters, or, in terms of Gorkamorka, it’d be pretty good as a mounted rokkit launcher thanks to it’s rather nifty integrated monopod. It’s been quite a while since I wrote part one of my spraypaint guide, but here’s the second half. As I mentioned in the first half, caps matter when painting. There are a whole variety available, more than I can even tell you about, but you don’t need to know everything, just what works well. If you buy low quality spray paint you’ll probably get a cap that looks like this one. Perhaps this isn’t true of all low quality paint, but in my experience it’s true. It’ll give a relatively thin line of paint, splatter everywhere, and not forgetting its miraculous ability to leak all over you. If you’re buying paint from a store that sells graffiti paint (my current favour is the Monster Colors online store) then it should be easy to pick up some caps at the same time. Don’t worry, they’re quite cheap (~£2 for ten at the time of writing). 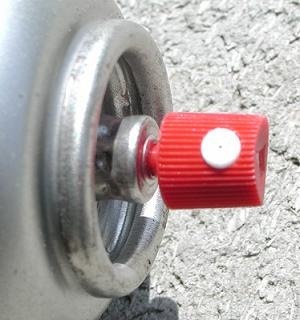 The two kinds of caps I’d recommend for spray painting models are fat caps such as “pink dots” and calligraphic caps. The former is a wide spray that should allow you to quickly cover a vehicle or piece of terrain in a few passes, the latter provides a thin line of paint that can quickly be passed over things. 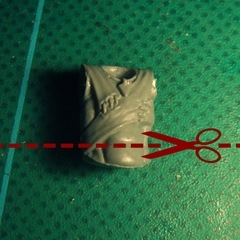 By “a thin line” I am referring to a sort of fan shape that can allows a screen of paint to be run over models – it’s my cap of choice for most things, including individual miniatures, although it does require much quicker strokes. This is one of the reasons I favour spray paint intended for graffiti – it sticks to just about anything. 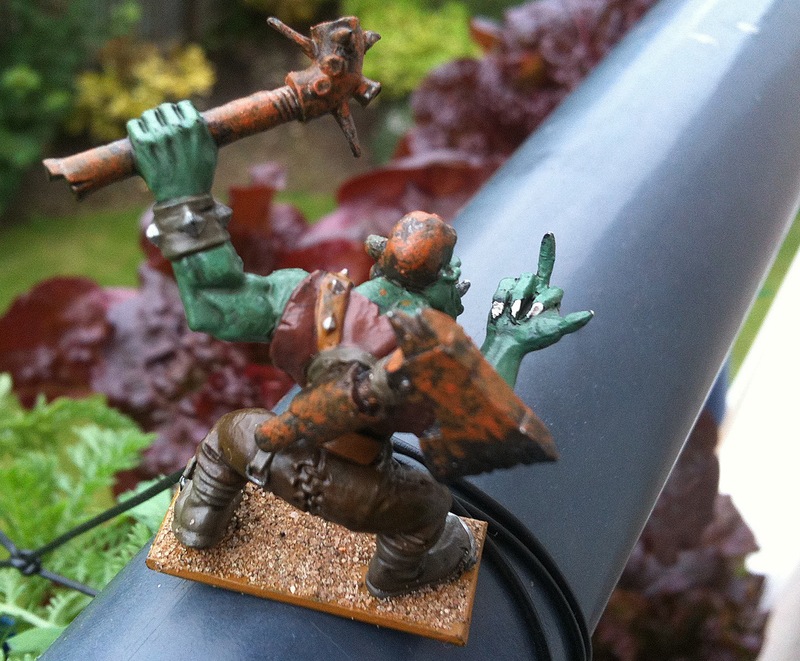 Whilst other paints might require you to carefully wipe models down and prime them, that doesn’t apply with decent graffiti spraypaint. 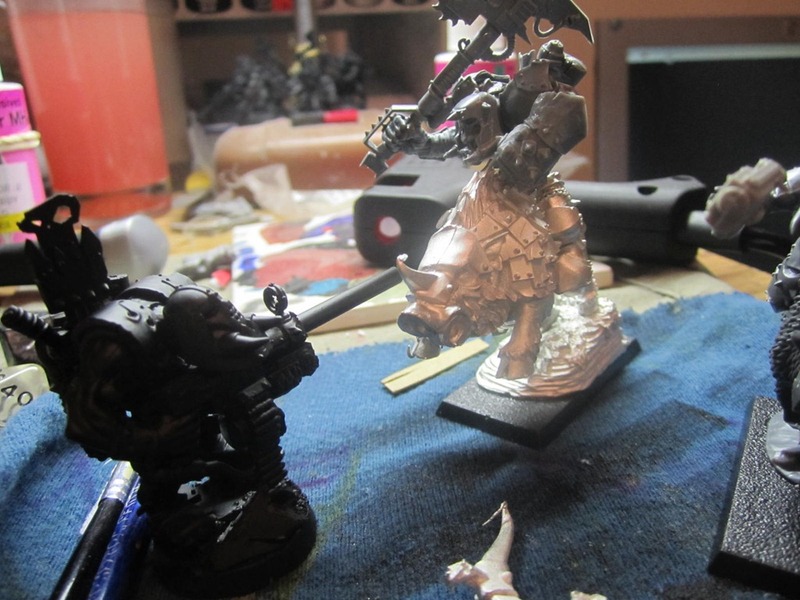 Make sure they’re not too dusty (you want to paint the model, not the dust) and then start spraying! The way the paint is used is pretty important and I’ve seen a lot of people treat it as if a slow and deliberate coat is the only way something will stay painted. Actually, that’s the exact opposite of what you want to achieve. 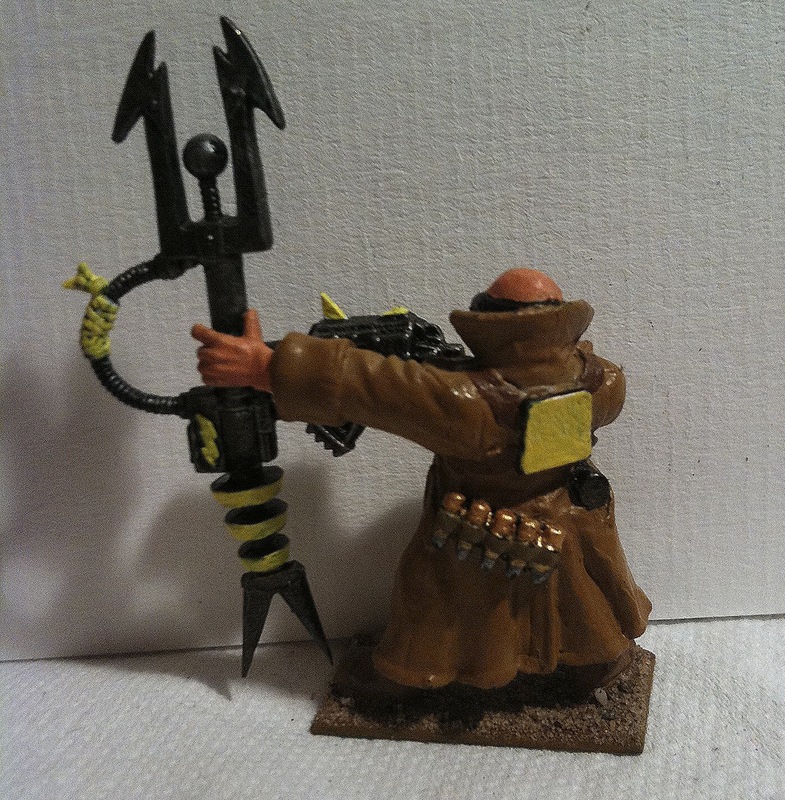 Quick coats are far better for models, otherwise you’ll find you’re clogging the model with paint and destroying all the details with large gobs of paint. 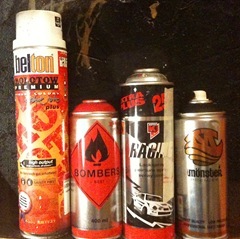 Before I continue, I want to mention drying time – graffiti spraypaint is designed for just that – graffiti. What this means is that it’s designed to dry quickly, stick to itself and not have many issues with what is being painted (hence why no primer is needed). What this means is that a quick coat will dry in seconds. I’m impatient and it’s often cold outside, so the sooner I’m done painting, the better. 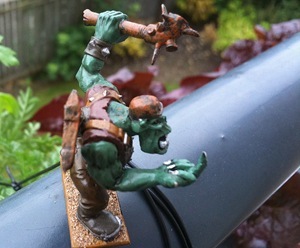 Once you’ve painted the model, give it a little while to dry (drying can be sped up using a hairdryer) and check it somewhere with even lighting to see which bits you’ve missed. If you got it all first time, well done, if not, take it outside and give it another blast. Final quick tip – if you’re painting individual warriors, try sticking them to the edge of a cereal box. That way you’ve got a convenient way to pick them up and get them from different angles to ensure decent coverage. If you have any questions, leave them as a comment and I’ll do my best to answer them! 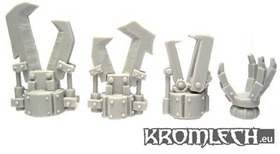 Just a short note to say that Artur from Kromlech has recently mentioned that there’s some Ork pirate parts in the pipeline, the first of which is apparently a hook hand replacement. This may seem trivial but what it means is that very soon there will be one kind of replacement arm that doesn’t have a model available for it (the telescopic arm). 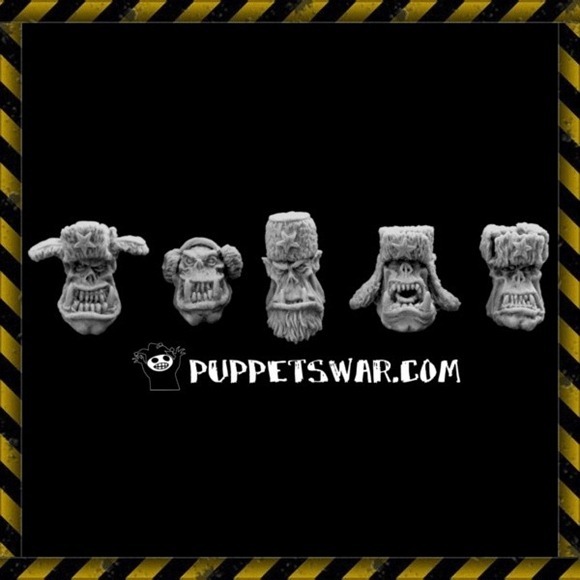 If there’s any Gorkamorka parts you particularly want to see produced leave a comment and we’ll see if we can convince them to have a stab at them! 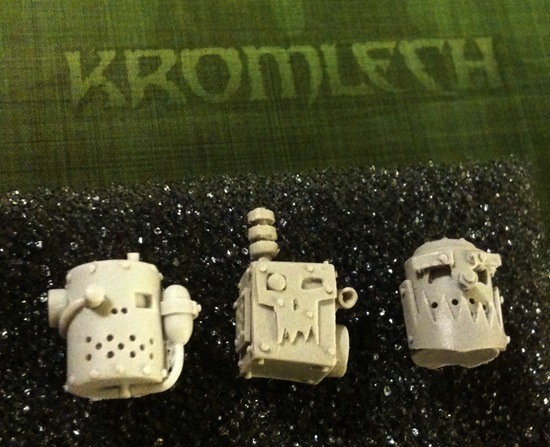 As part of Kromlech’s Clanking Destroyers some awesome heads were sculpted by Marcin “Majster” Szmyt. These currently aren’t available on their own but may be for sale as a pack in the near future. 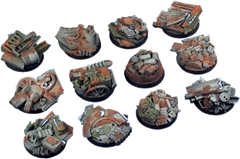 If you were at Salute 2010 you may have got your hands on them already as part of a Clanking Destroyer, but even those aren’t available on the MaxMini store at the time of writing. The head on the left in the photo below is visible in the Clanking Destroyer preview photo, but we’d not seen the other two before and it’s safe to say we were all impressed. These look ideal for Orks who’ve been given an Iron Mask, or for building Da Krusher (there’s never been an official release of him, after all). If they become available we’ll post a link here of where to get them. Until then maybe drop the Kromlech guys an email to let them know how much you want them? 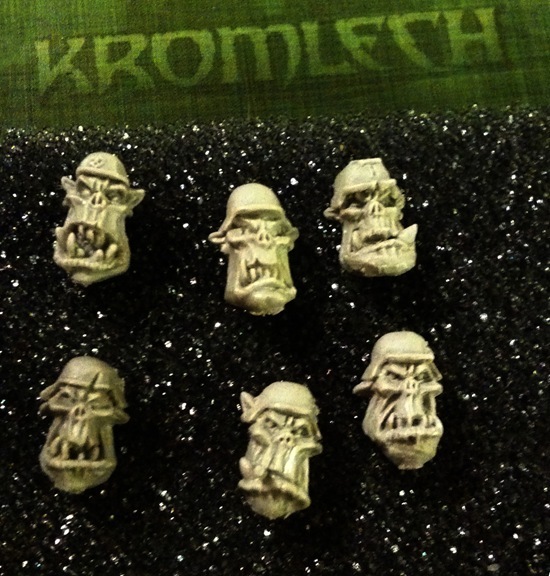 One of the other things Kromlech sent us was a complete set of the first Orc War II heads. 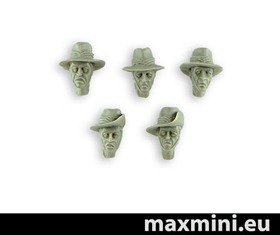 These are already available on the MaxMini Store, so you might have seen them already. We hadn’t and think they’re pretty awesome. 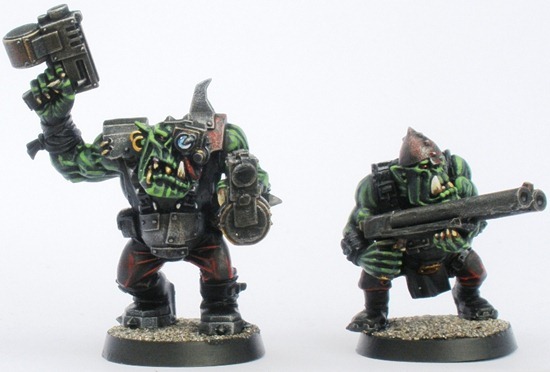 They were sculpted by John Connor and would fit in perfectly with any Ork mob, although they’d make great Gorkers or Morkers we reckon. 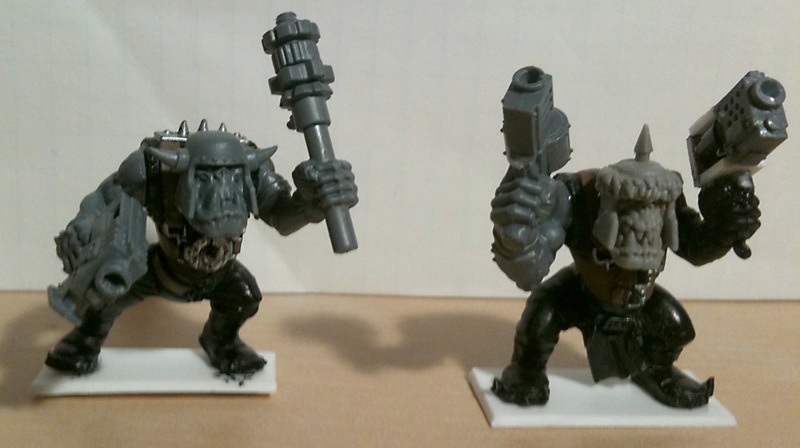 Below is a photo of what they look like unpainted to give you an idea of what they look like when you receive them. Other than that there’s not much to say. 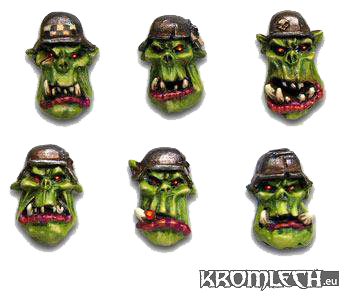 Awesomely Orky heads, available now, reasonably priced. Enjoy! 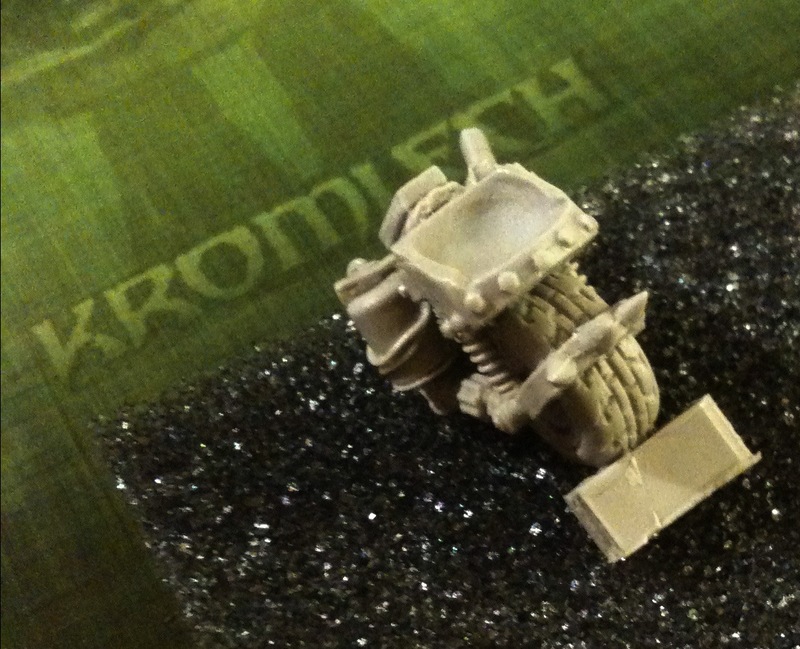 We gave you a teaser on Monday that we’d received a package, the time has come to reveal the contents, all of which are courtesy of the awesome folks at Kromlech. 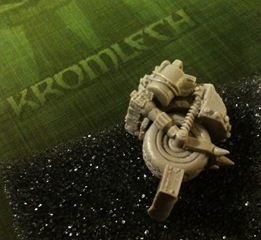 The first special thing is a pre-release copy of the gyro-stabilised monowheel sculpted by Hamster_52 which fits a modern Ork/Orc torso perfectly and looks fantastic. In our GoMo campaign we’ve already had one lad who has got one of these, but up until now we’ve had nothing to model it. This one is shortly going to be grafted to a lucky Ork freeboota known as Carudders, the old Kaptain of Da Cuttas Ov Da Jibb. They’re not available on the MaxMini store yet, but when they are there’ll be a link here. They’re apparently part of a range of orks (ahem, “orcs”) called “Orc War II”. 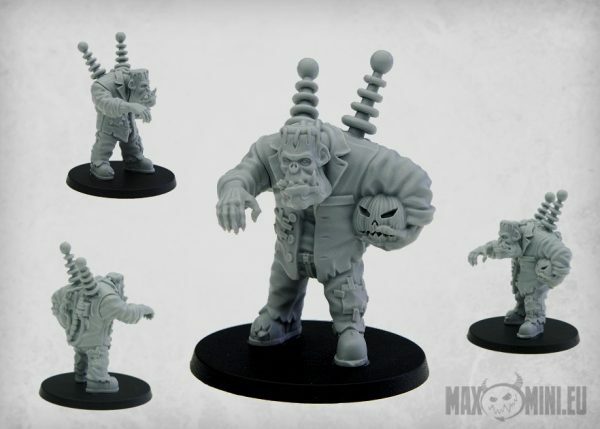 If they’ve already been sculpted, cast, and painted, we would imagine they’ll be available at MaxMini soon. Probably. 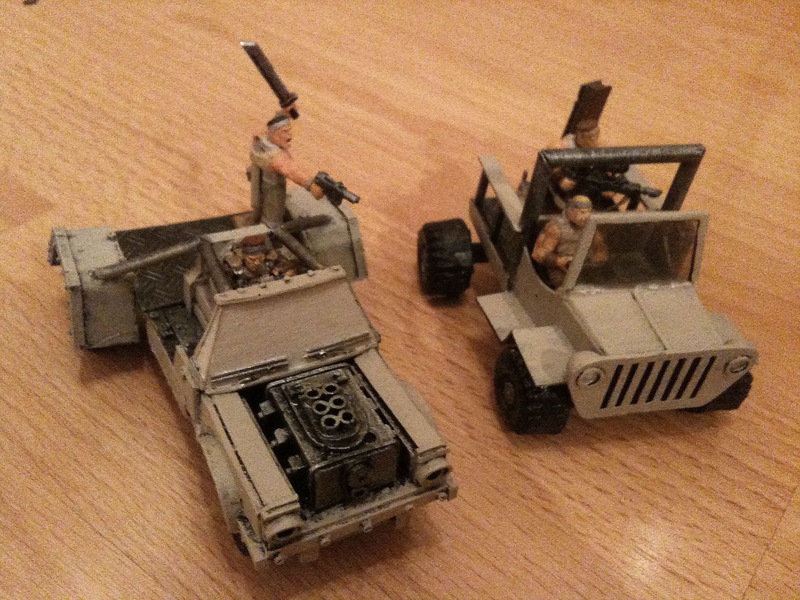 They may have been available at Salute 2010 which was this weekend, but they’re not currently on the MaxMini store. 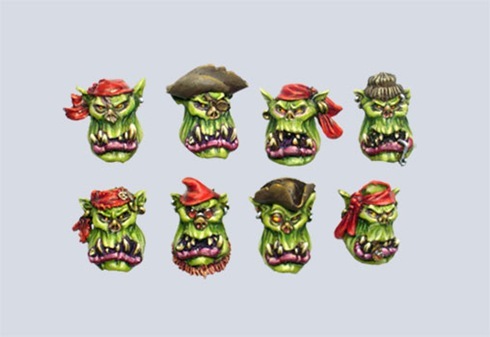 If you’re looking for some more heads, or perhaps you want to make a themed mob, these might be just the ticket. 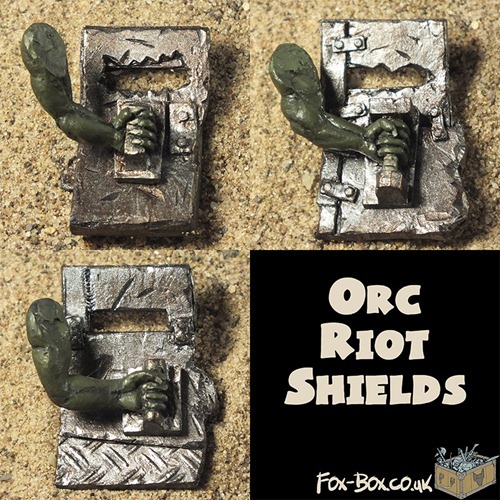 We look forward to seeing what other Orc War II goodies are in the pipeline! We’ve had a few bioniks come up in our GoMo campaign so far, but most haven’t been painted yet. 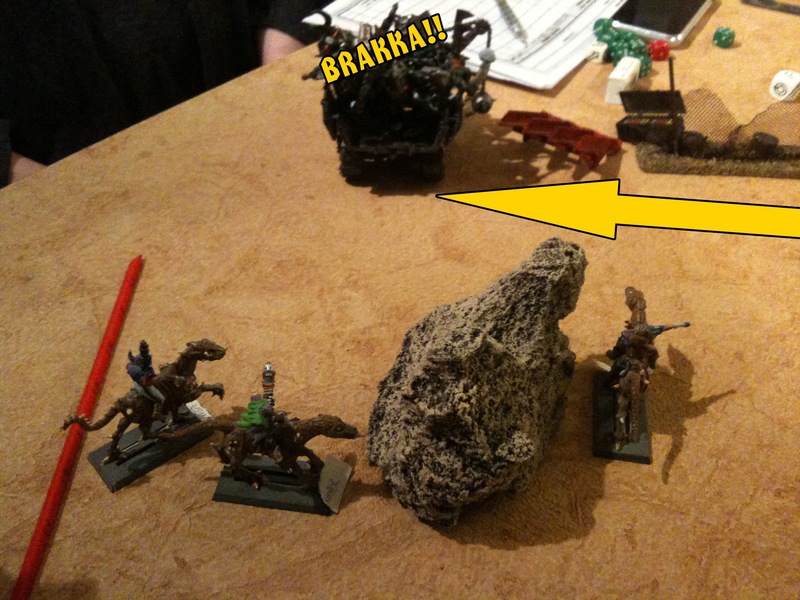 In a previous game during an intensive day of play (we managed about five games, one of which will have a battle report) one of Grimlug’s Ladz received a claw arm. 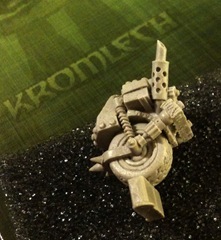 Now there’s plenty of power klaw models out there, but we wanted to try out one of the new Kromlech claw arms (available from MaxMini), so a hand was dipped into the communal bitz box. 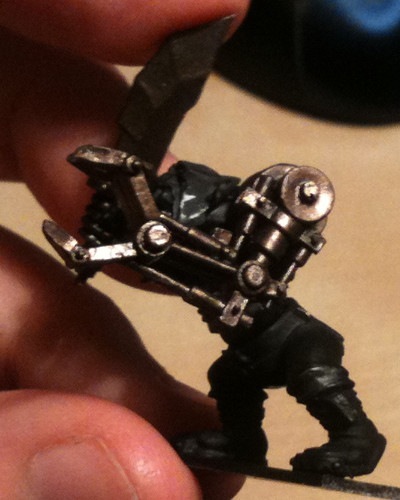 After undercoating the arm in black, it was lightly painted with Tin Bitz (GW) (not fully painted, not quite drybrushed). 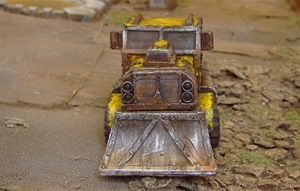 The rest of the model was painted and then rust was added to the model’s metal surfaces. This was done using this method. There you have it. Click on the images for bigger versions. Back in January we posted an old White Dwarf article about collecting a GoMo mob, since then one of our starting mobs, Nazgrab’s Yella Deff, has grown quite considerably and now has a mob rating of 293. Whilst this is great, it does mean I’ve hit a bit of wall – the mob is significantly ‘arder than all the others in our campaign. To alleviate this I’m temporarily retiring Da Yella Deff and starting another mob. Once the other players’ mobs catch up, Nazgrab and his boys will be back for more. This one’s easy – Nazgrab and his lads are Morkers and favour lots of vehicles and speed. 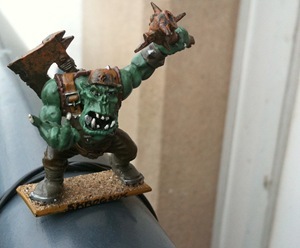 My new mob is going to be Gorkers. Lots of spikes and weaponry. 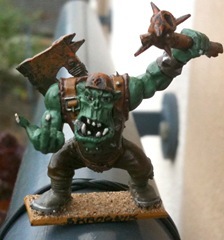 Grimlug is my Gorker nob. He’s built from parts from several sets, although mostly he’s from a 40K ork nob box set. His kannon is clearly custom built, mainly because I couldn’t find any resin kannons when I came to build him. Conveniently it’s actually exactly right for the left over kannon shells we had from building the belt-fed twin-linked kannons on Da Yella Deff’s bike. I’ve also given him a choppa, giving him a decent chance both in melee and at range. As he’s got both BS4 and WS4, it’d be silly not to make good use of him. Rotgrim and ZodZod are my spanners. I don’t actually need two, but I feel I’m cheating a little with my overly large trak and plan on buying a suitable buggy or trukk after a few games to give the boyz a bit of breathing room. 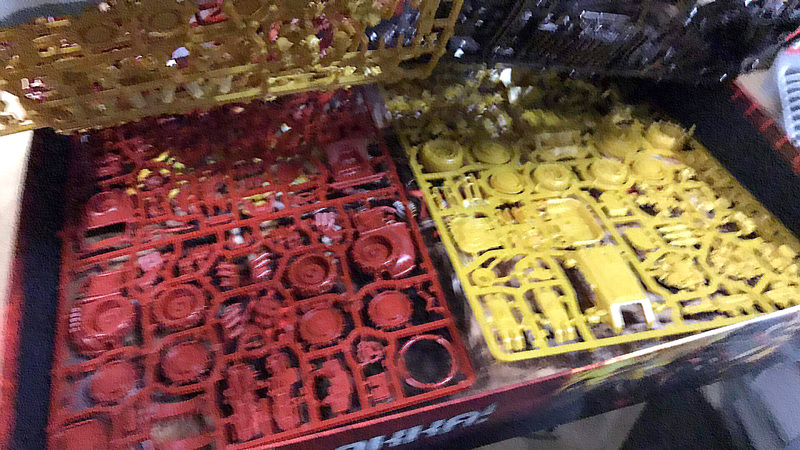 Rotgrim is packing a kannon (custom resin cast) and an original Gorkamorka weapon sprue choppa whilst ZodZod is going to be manning (orking?) 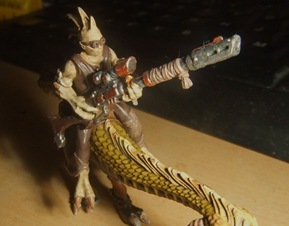 the trak’s ‘eavy shoota. See what I mean about an oversized trak? It’s made from an original GoMo trak, a 2nd Edition 40k ork warbike, a headlight from a modern ork warbike, an old GoMo ammo box (which is oddly exactly the right calibre ammo for modern ork big shootas..), oh and a hell of a lot of plasticard. It’s got Zogdreg as the driver, one of my three yoofs. He’s not carrying anything more than his knife – he’s got the lousy job of getting the mob to its next fight. 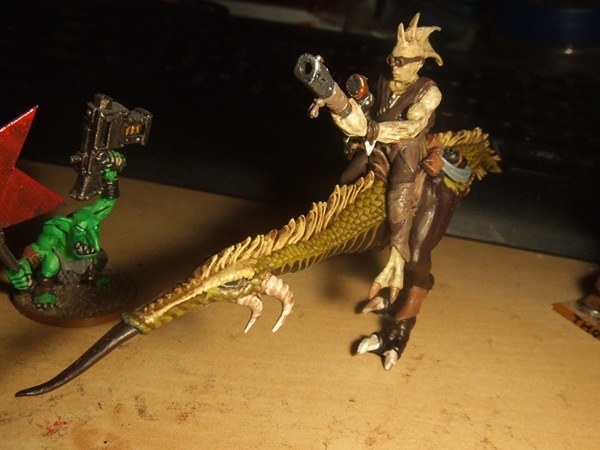 I thought that as I was trying to play differently with this mob, I’d give the ‘eavy shoota a try. 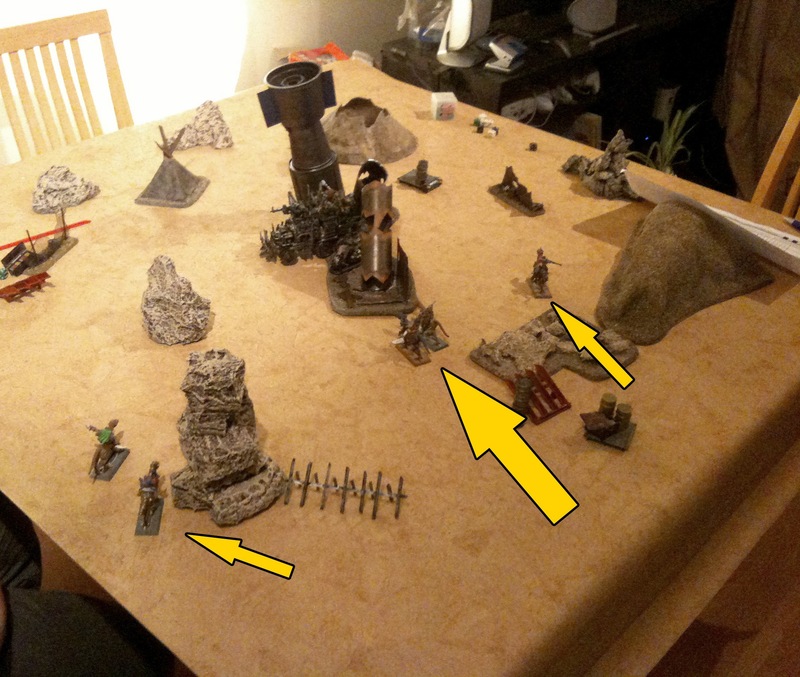 It costs as much as the trak itself but could be worthwhile – after all, it fires 2-6 shots per turn at S5, some of those are bound to hit, right? For now I’m not going to bother with a slaver, but perhaps later some diggas or grots will come in handy. Just to get in the enemy’s way, right? To start with I’m just going to be fielding two boyz – Gorog and Wazbag. 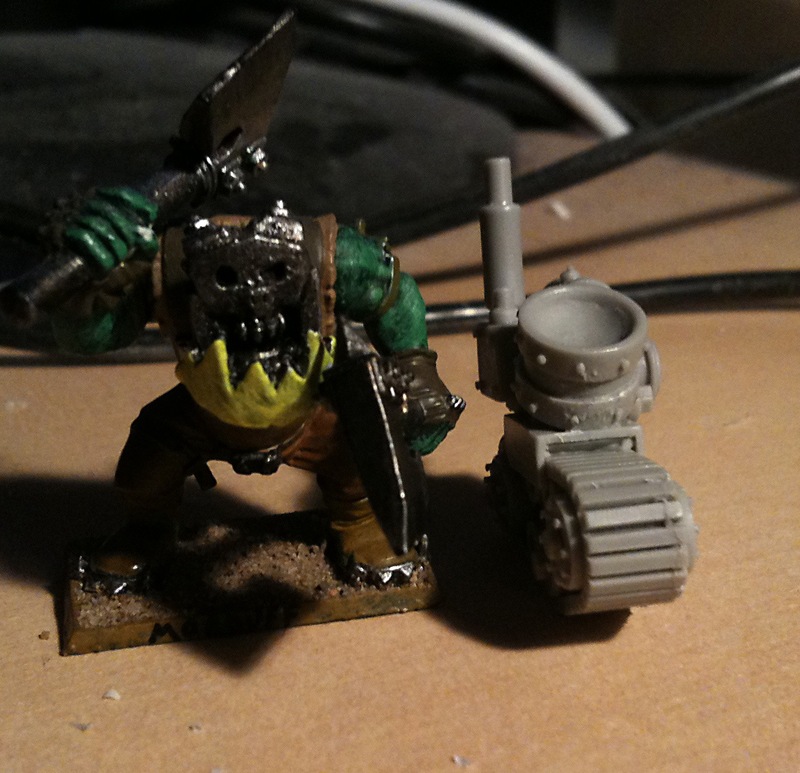 Gorog has a club (courtesy of the biker sprue) and a slugga. 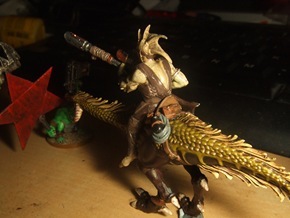 Wazbag thinks he’s a deadeye gunslinger and is packing two six shootas to prove it – annoyingly I can’t find any resin six shootas either, thank you, irony..
I’ve already mentioned Zogdreg, the trak driver, but there’s two others in the mob too; Gutrunt and Dursnaga. 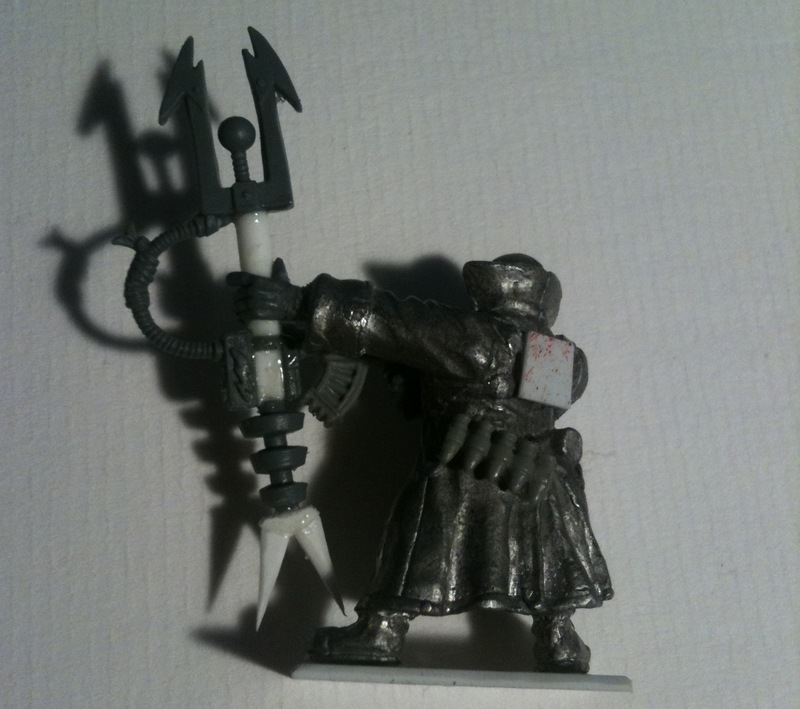 They’re each armed with a choppa and a club, Gutrunt’s club from the biker sprue, Dursnaga’s from the remains of Nazgrab’s old harpoon gun. 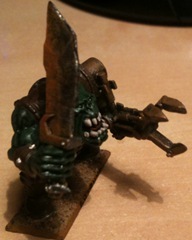 As I said earlier, no grots for now, maybe later. I’ve sorted out their experience and the total mob rating comes to 116. Not particularly high, particularly compared to the others in the campaign, however, if they win they’ll be looking at a pretty sweet income bonus and a bit of extra experience either way! By the way, if you’re struggling with naming your orks, try out this orky name generator. Artur has been busy again. 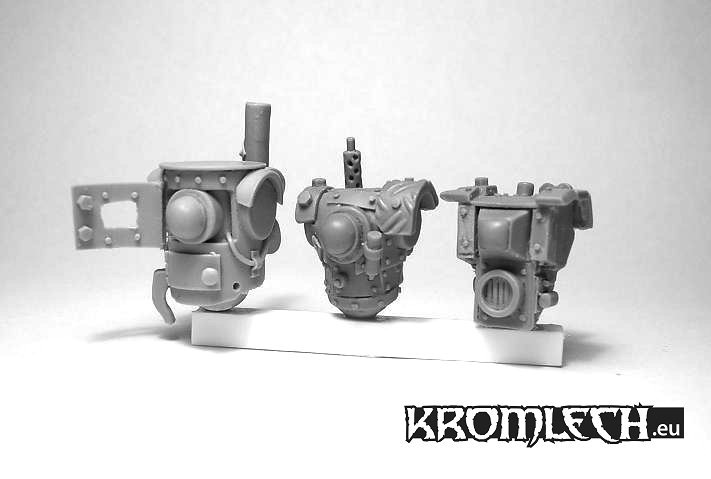 Some of you might have seen this preview torso that appeared on Kromlech at the end of February and it’s been a while since then, but new pictures are available! The parts should hopefully be available within a week or two on the MaxMini store, but that’s just a guess. I’ll be picking some up eventually, but not until after the other bionic legs go up. At this rate the Cuttas Ov Da Jibb will need as many of these as they can get by then! I’m still trying to determine what they’re supposed to be though, which is a little embarrassing! 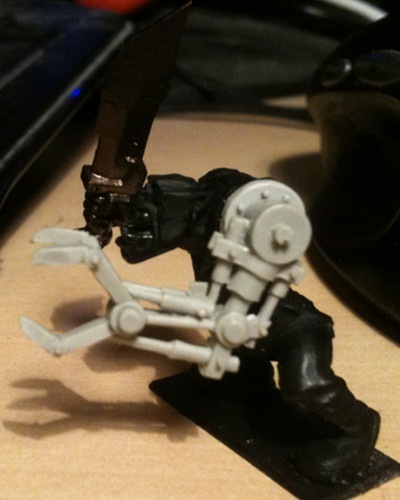 The first is a Cybork Body, I think, but the rest are a little more interchangeable. I’m guessing one is a Kustom Thruster Booster whilst a third might be a Fuel Injection Implant, but it could be an Iron Lung or even Fungus Bref Lungs. If you know, or just want to take a guess, leave a comment! I may seem like a shill for these guys, in which case I apologise, but that’s not the way I see it. 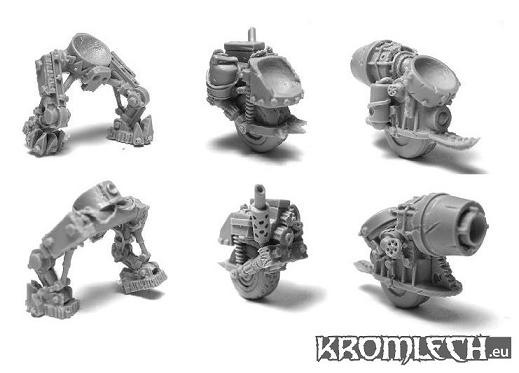 This company have recently started producing something I’ve wanted for years – bionikz for modern-scale Orks. 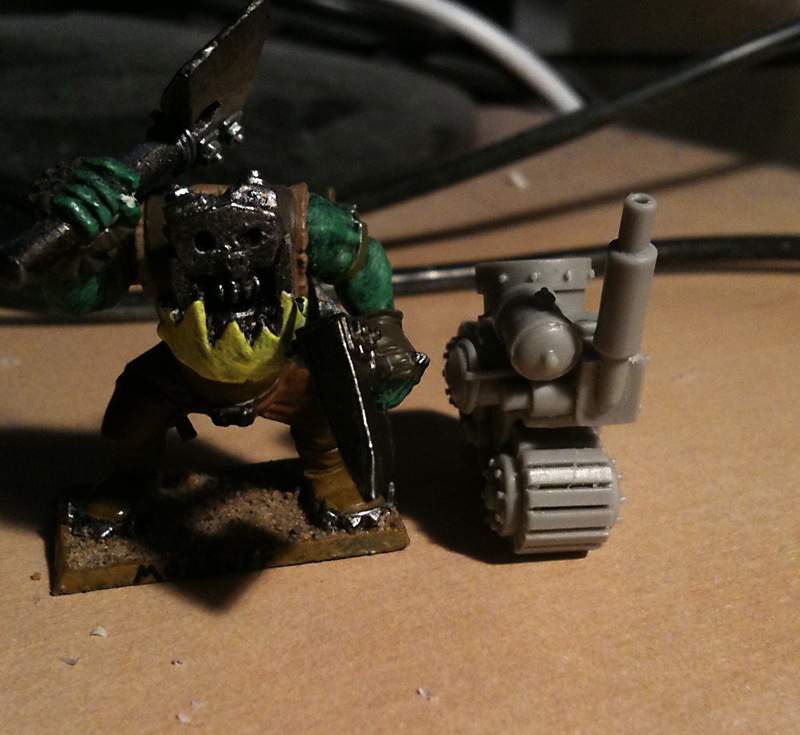 I own the old gubbinz and they were pretty lacklustre and of course were designed to fit the tiny GoMo Orks. Having handled these new parts, I can sincerely say they rule and they’re not expensive either. 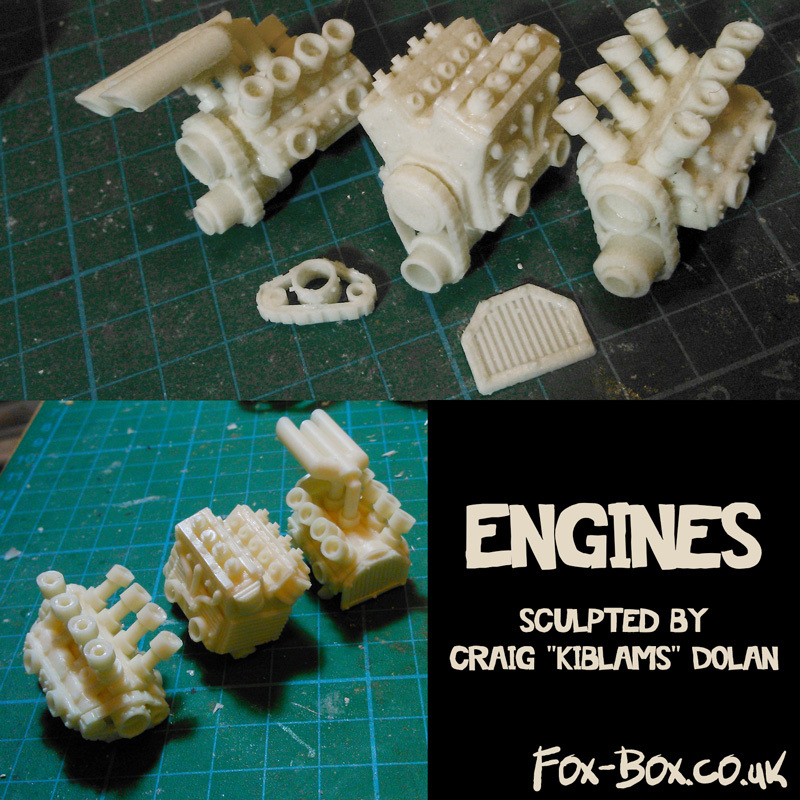 I will say this though – if you want the parts, order a couple of weeks in advance or use their courier. I used their regular postal service and was not too happy about the shipping time. Previously I showed off my GoMo veteran with his long rifle, today I present a CO (Commanding Officer). 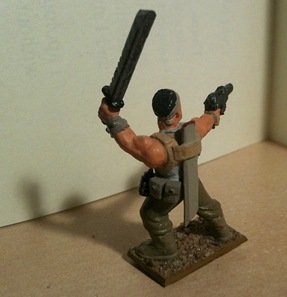 He carries a laspistol and a sword, playing to his strength – hand to hand combat. He’s an excellent shot like all from his faction, but he has the advantage of thorough combat experience, unlike most of his troops. As you can see, he’s a pretty good all-rounder. His leadership rises to 8 when he manages to be victorious in a battle, just like other mob leaders.? Currently we’re undecided if he’s subject to pinning like other humans, although the normal warriors in the mob would suffer from pinning. There’s also an idea we’re working on regarding bottle tests and extra dice or modifiers based on the number of officers still on the table, although it’s a work in progress. His laspistol is amongst a class of weaponry available to the faction that is (at least currently) limited to warriors above a certain experience level. 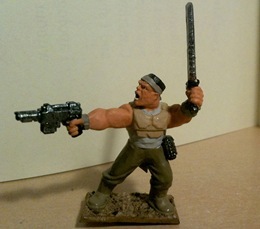 Higher technology such as las-based weaponry can only be used by suitably seasoned warriors, partly to limit the strength of the high ballistic skill of the faction. It’s supposed to be a unique trait, but not overkill! Anyway, feel free to add your comments (click the link in the oil splash at the top). 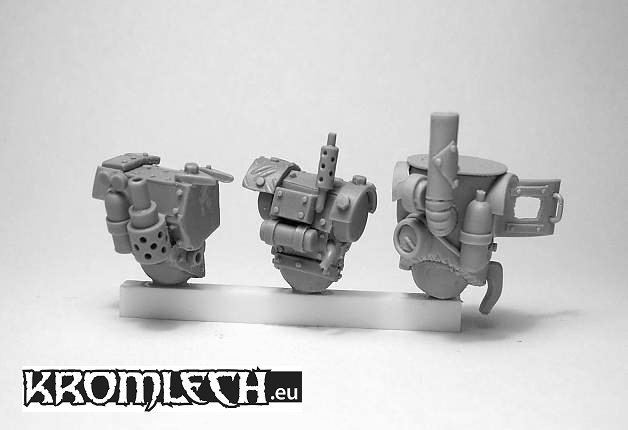 I’m not really sure what to make of this, it’s clearly Orky but I’m not quite sure what one would use it for..
It’s a “Wunderrocket” from MaxMini designed by Marcin Szmyt – ~€40 plus however much postage is). 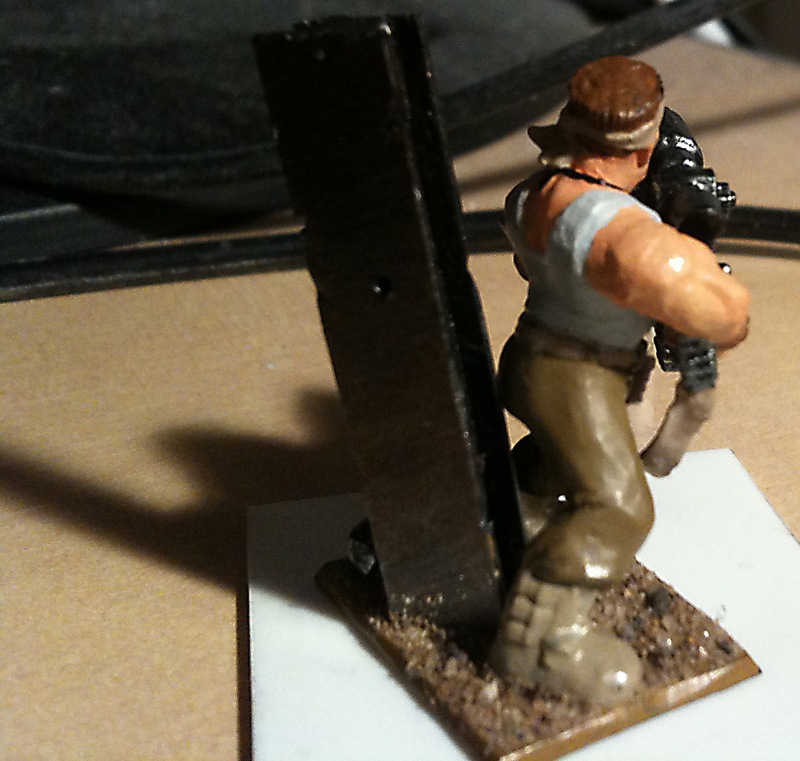 It could make a good objective to capture, or maybe require its own scenario entirely. 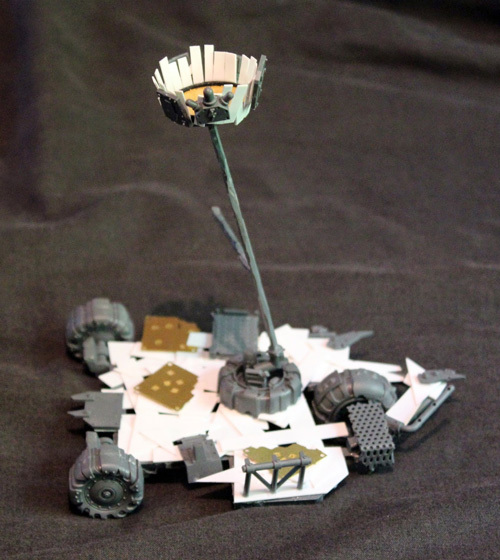 Alternatively, it could be a great basis for a mobile weapons platform or something. I just thought I’d throw it out there, I’m sure crazy ideas will appear in time, let me know what you come up with. Well, we’ve been waiting for a little longer than we’d like but the wait is finally over – our MaxMini/Kromlech parts finally arrived! 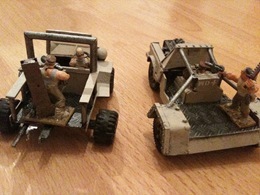 Here’s a photo of the traks that are available. 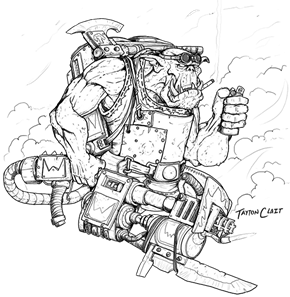 Unfortunately we can’t show you them on a model yet as this particular set is for the Kaptin, Grob, of our GoMo campaign’s freebootaz. 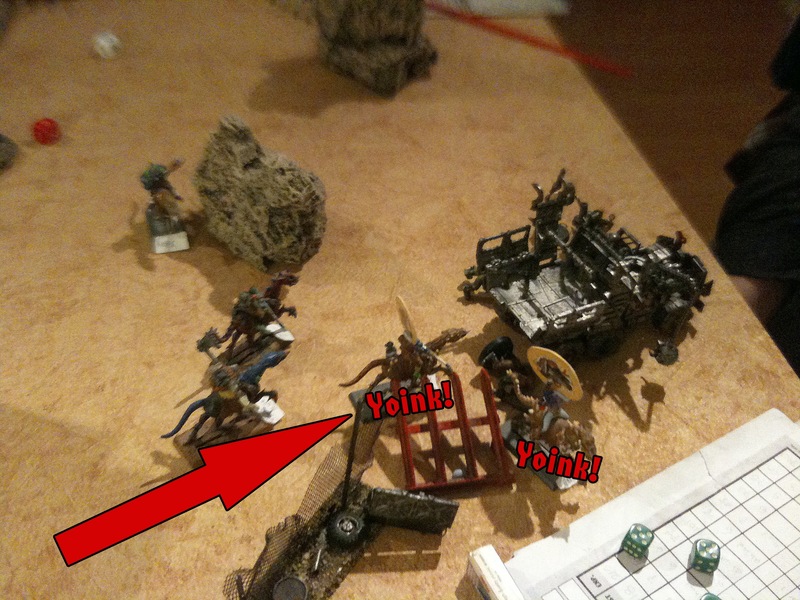 He recently visited the dok as you might have read in the latest battle report. Thanks go out to Morduff for posing alongside the traks for a sense of scale. As you can see he recently went under the knife himself. 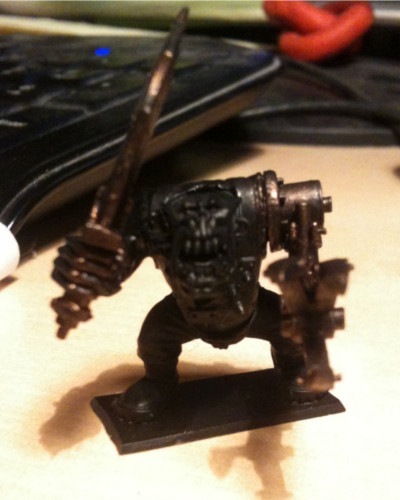 Hopefully there’ll soon be a good model for Iron Mask, although Black Orc heads are pretty awesome for that purpose too if you don’t feel like converting one like I did. 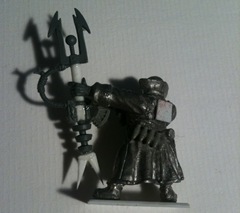 He’ll soon be sporting these in place of his horrid old legs, both of which were crippled, limiting his movement to 2" per turn. This prevented him from doing more than riding around on vehicles or shooting. Ironically, in game terms he now counts as a vehicle! Each of these photos links to a better quality high-res photo to let you get a clear idea of how they look. Once they’re painted I’m sure a photo will be made available for your viewing pleasure. 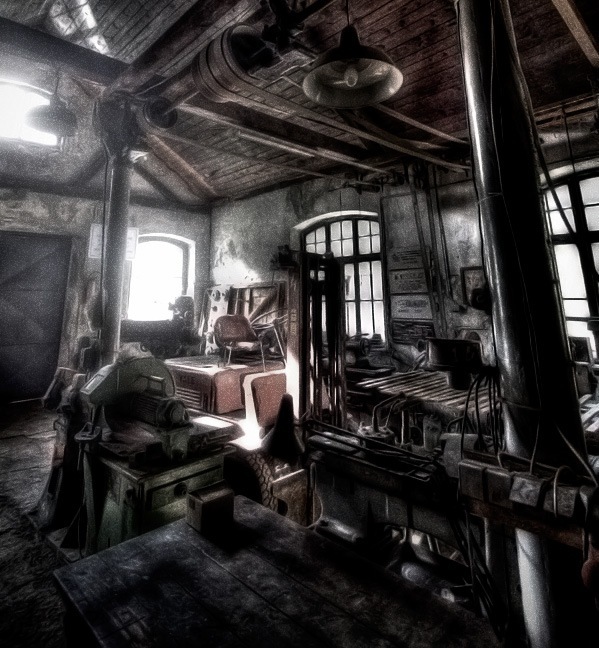 We’ve got all the other bioniks they sell at the time of writing, but we think we’ll save them for another post. 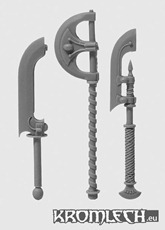 In terms of quality, we can say that these are beautifully sculpted, just as good as GW’s modern stuff, if not better. The bioniks are also miles better than the original pieces. We can’t post a comparison photo for these traks though, as none were ever produced! Normally you’d be able to grab your own set over here but they’ve been so popular that they’ve sold out for now. From what we’ve read, a fresh batch is being cast at the moment and they’ll soon be available again. Edit: They’re now back in stock! 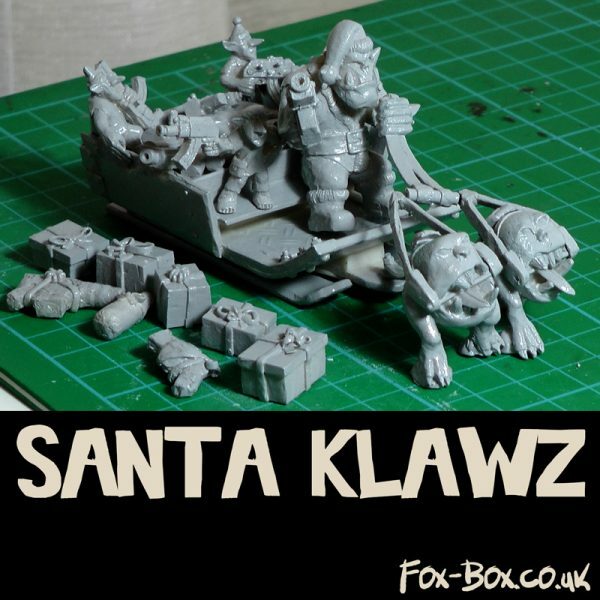 No sooner had I posted about the awesome new bitz sculpted by Kromlech when a new announcement went up, with new, awesomely fantastic, replacement legs! From left to right, if I’m any judge at least, we have De-Lux Kicking Legs, Traks, and Telescopic Legs. 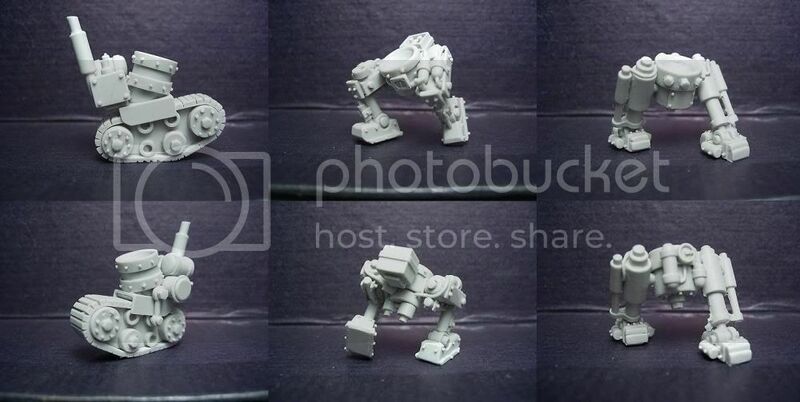 Technically the De-Lux Kicking Legs should come as individual legs, but I think they can be let off the hook as the original GoMo models for same were not individual legs. I think my favourite is the traks, they look fantastic. I’d love to tell you if they’re going to release any for the others (Peg legs, Gyro-Stabilised Monowheel, and Wheels) but I’ve no idea, we’ll just have to wait and see. They’re not available in the MaxMini store yet but I imagine it won’t be too long before you can get your grubby mitts on them. 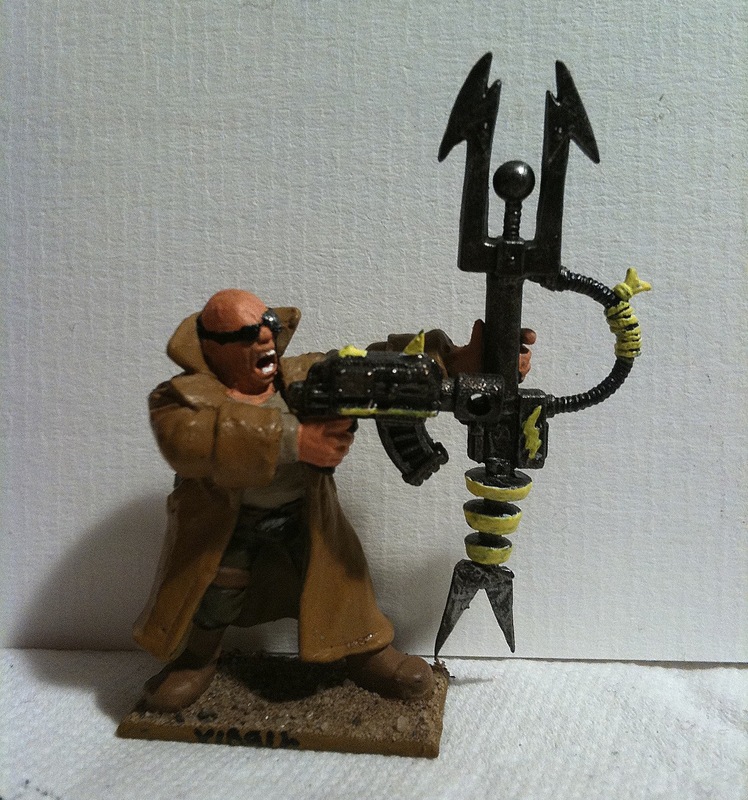 One thing that is even less available these days than six-shootas and kannons is bionikz. 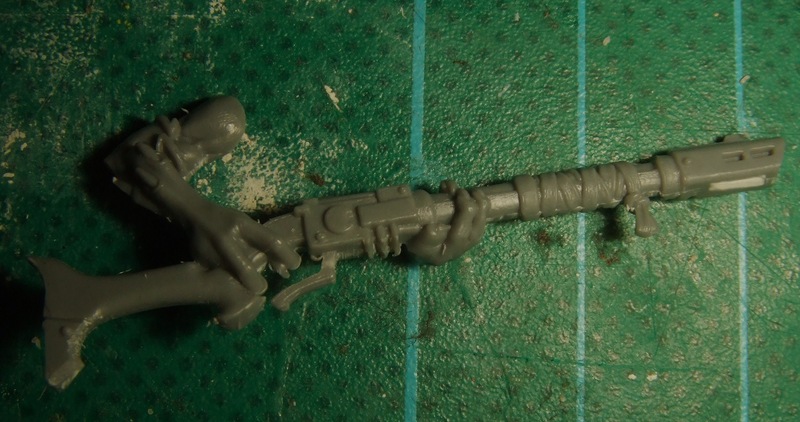 Whilst Orks are easily available, if you need to fit them with a shoota arm you’re out of luck, unless you’re willing to convert the part from scratch. Well, MaxMini.eu are releasing some conversion bits sculpted by Marcin Szmyt over at Kromlech. 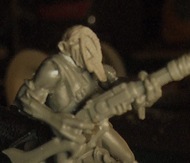 I don’t think the shooty arms are available just yet but I don’t imagine it’ll be too long until they too are available in the Maxmini store. I also hear that there are further bits to come, which makes me happy. They’re priced at €5.65 for a bag of five randomly selected arms, or $8.36 (US). Not too shabby! 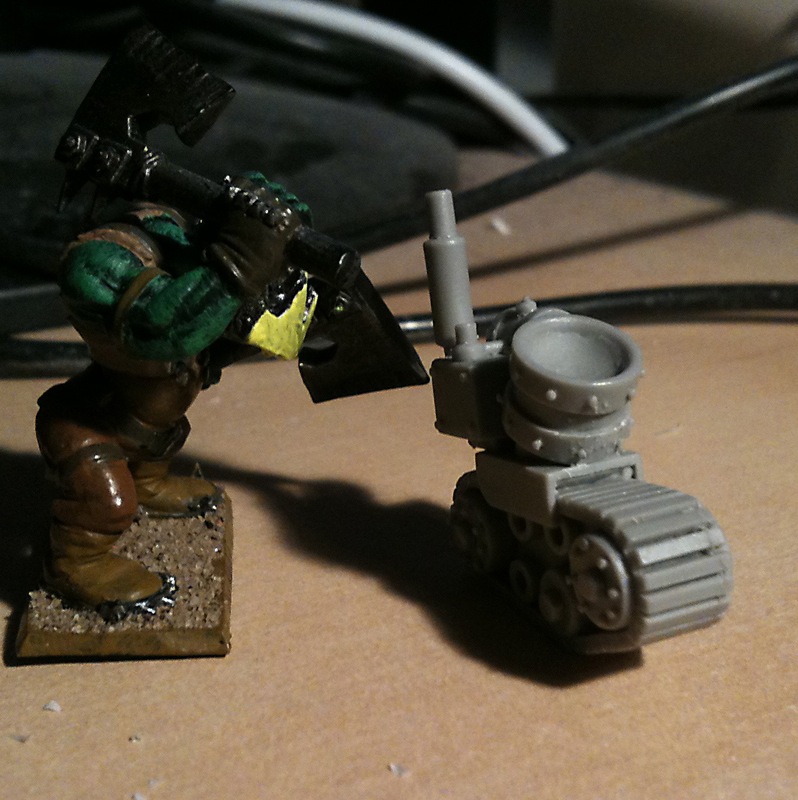 Something that I technically probably knew, but had always overlooked with regards to GoMo’s standard Ork mobs is the fact that they are entitled to hire Diggas. An Ork mob may hire Digga warriors, in the same way it hires other fighters. The mob must have a Slaver to include Diggas. 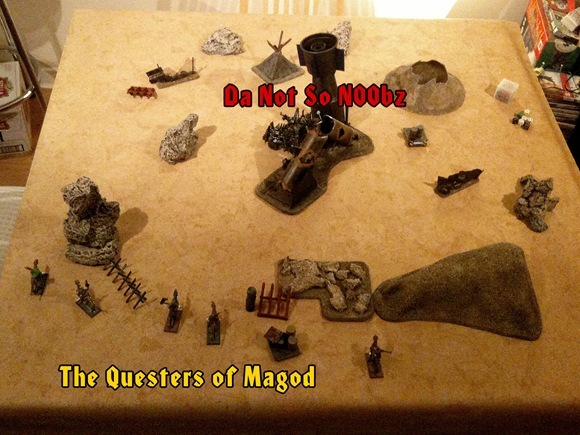 If the mob has a Slaver it may hire Digga-Boyz, Digga-Yoofs and a single Shaman, although his services are rarely needed to actually keep them under control. 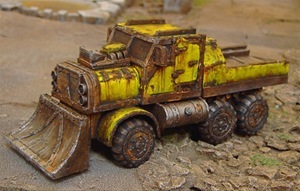 A hired Digga is treated like any other mob member and is chosen and equipped from the Diggas for Hire list as normal. When working in the scrap mine. 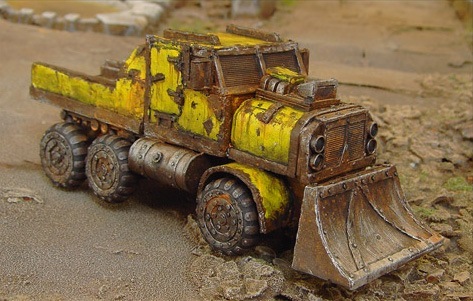 Digga-Boyz and Digga-Yoofs may dig D3 teef worth of scrap. A Shaman will not dig but may conduct a ceremony of searching This works exactly as normal and allows the Orks to add 2D6 teef to their income if successful. 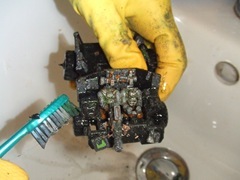 If a mob falls so low that it has to resort to hiring Diggas, it is likely to lose .1 lot of respect from other Orks. For this reason, an Ork mob with Diggas fighting for it must follow the Digga rules for visiting the Meks. This means that until its mob rating reaches 200 it must deduct -1 for any rolls on Da Big Day chart. 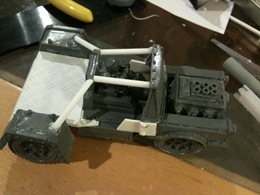 Note that the mob’s Spannerz may still fit gubbins as normal though. 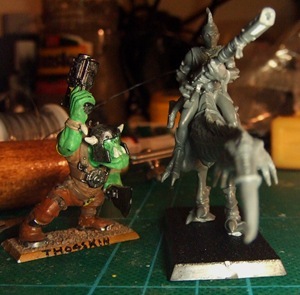 My mob, Nazgrab’s Yella Deff has previously hired grots, picked out by the mob’s ruthless slaver, Grimfang. After a rocky start, Nazgrab has managed to get quite a rep around Mektown, giving him enough respect to hire Diggas without fear of anyone laughing at him, well, at least to his face. However, why bother hiring weedy Diggas unless they can do something special? In a brewhouse near the Job Pole he stumbled across a shady Digga carrying a rather brutal looking staff. 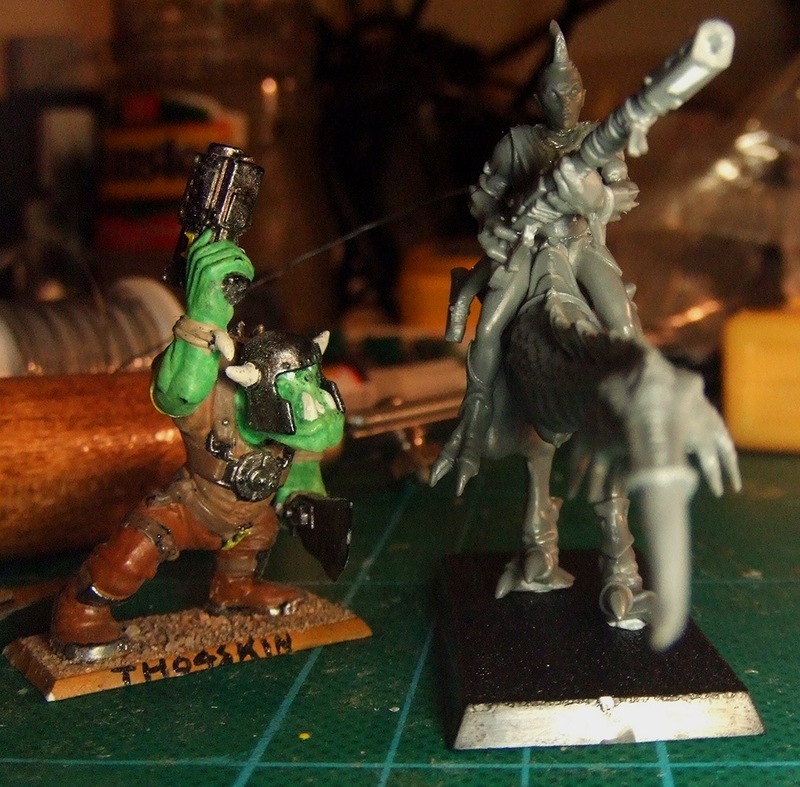 A few teef and a human-sized shoota changed hands and Virgil was on board. So far he’s just got a knack for finding scrap, but perhaps he’ll acquire some additional abilities as time goes on, we’ll see. In terms of the actual model, he’s a bit of a history lesson. His body comes from an old (Necromunda) Delaque heavy from the mid-nineties, so old that I’m fairly convinced he’s actually cast in lead. 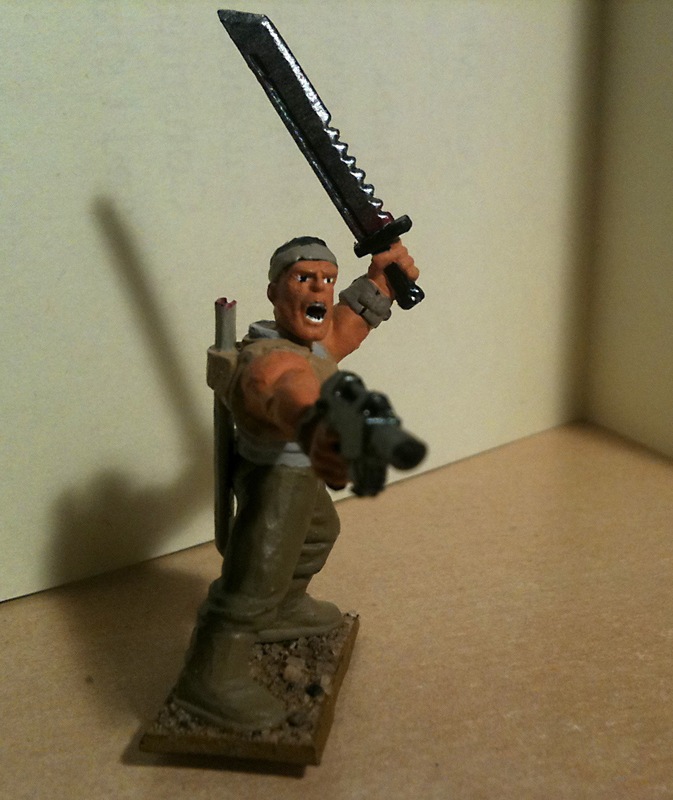 He has plastic hands from multi-part Imperial Guard Catachan Jungle Warriors released in the late nineties or early 2000s. 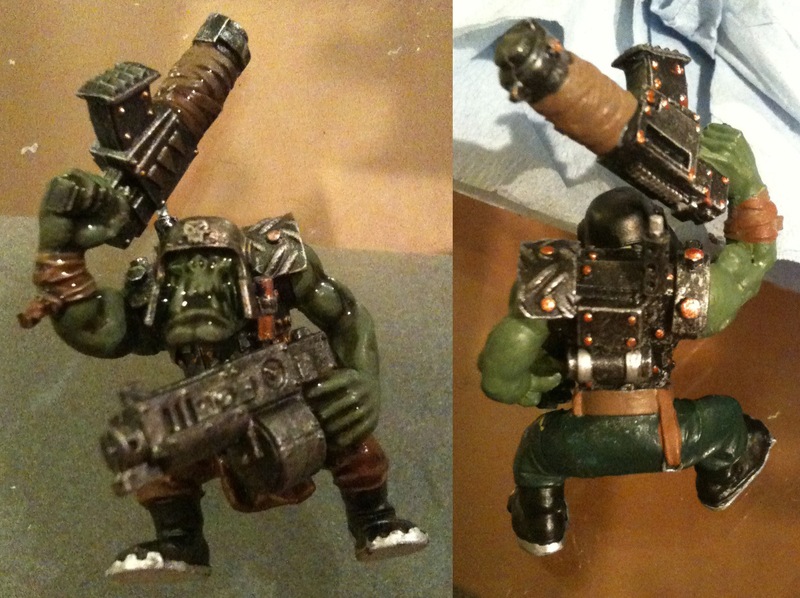 Attached to his waist are a set of Ork bullets from 3rd edition, around 2001 I think, the first modern multi-part Orks. He’s holding a shoota from the Gorkamorka boyz sprue from 1997 and his Findin’ Rod is made from a Grot Prod from the modern plastic Gretchin sprue. How’s that for nerdy knowledge? Here he is painted up. He’s not brilliant, I know, but then again it’s been about a year since I last painted humans and I’m just not that great at painting. 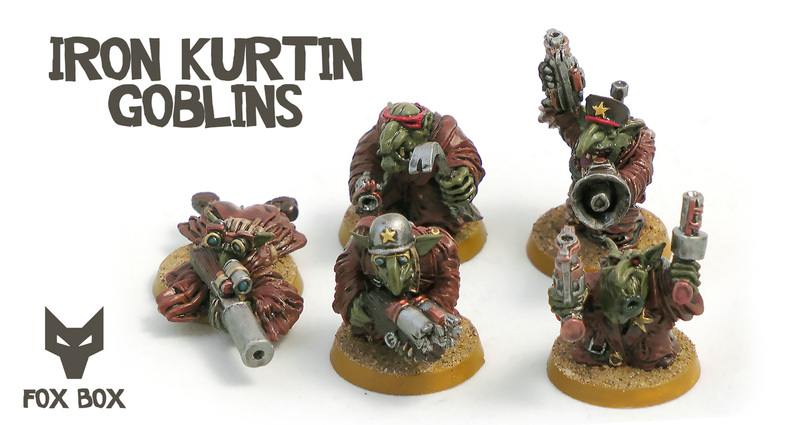 Here’s a mob listing from Gubbinz, a new kind of ork mob for you all to have a play with. 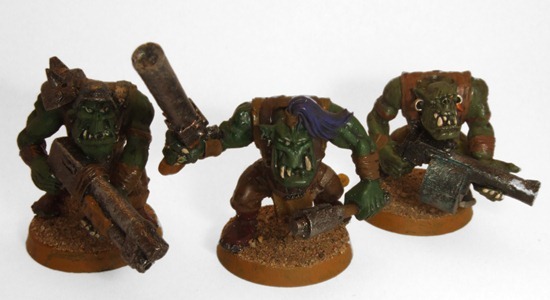 Currently our campaign features a group of these thugs known only as Cuttas Ov Da Jib but I’m afraid it’s too early to say whether these rules are well-balanced. 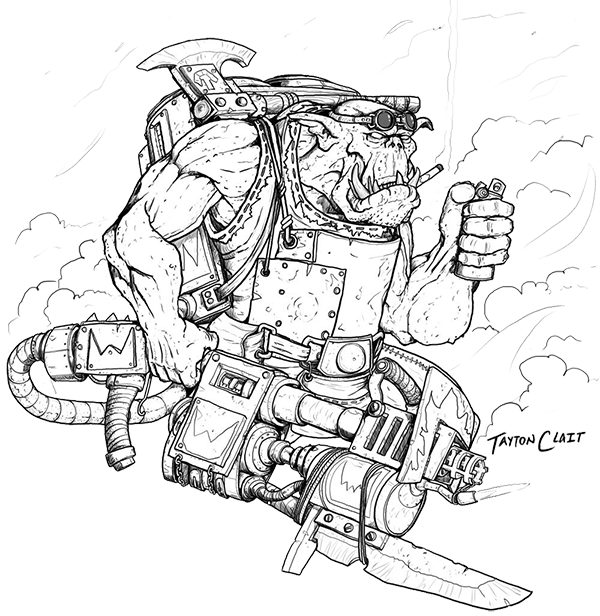 Written by Neal Plews and drawing on lots of the old background to the Orks, Freebootaz are quite different from Gorkers or Morkers. 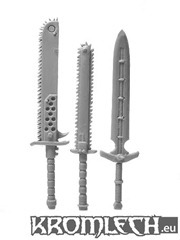 They won’t have anything to do with grots and can only have a single junior member at a time, they’ve also got their own skill table and huge cutlasses! 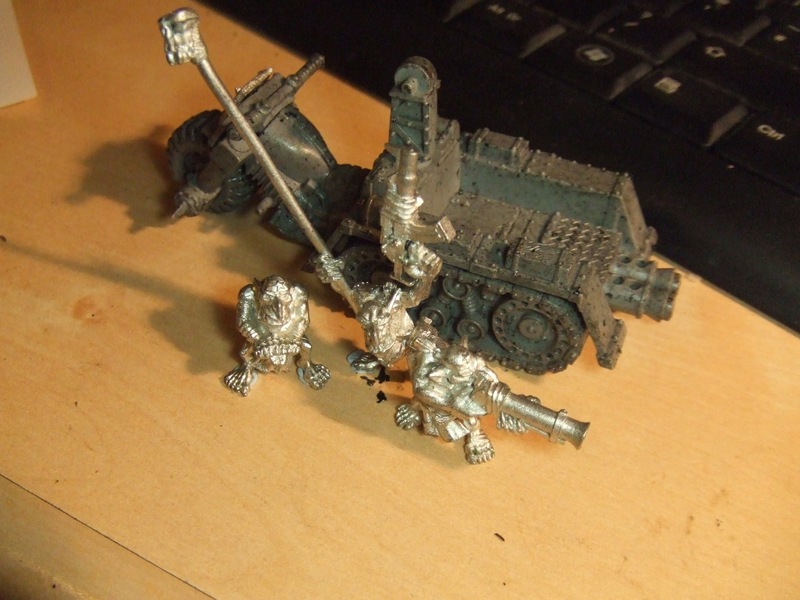 I’ll see about posting some photos of Cuttas Ov Da Jib when they’re painted, as until recently they were just stand in models (they’ve just got their mitts on their own trukk for example). 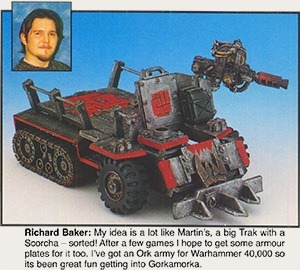 Back when Gorkamorka was released White Dwarf, issue 214 I think, ran several articles on the game (how surprising!). 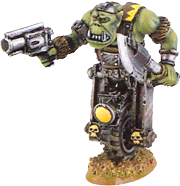 One of the articles was a rather good four page piece that is essentially “starting a basic ork mob 101”, written by Andy Kettlewell. 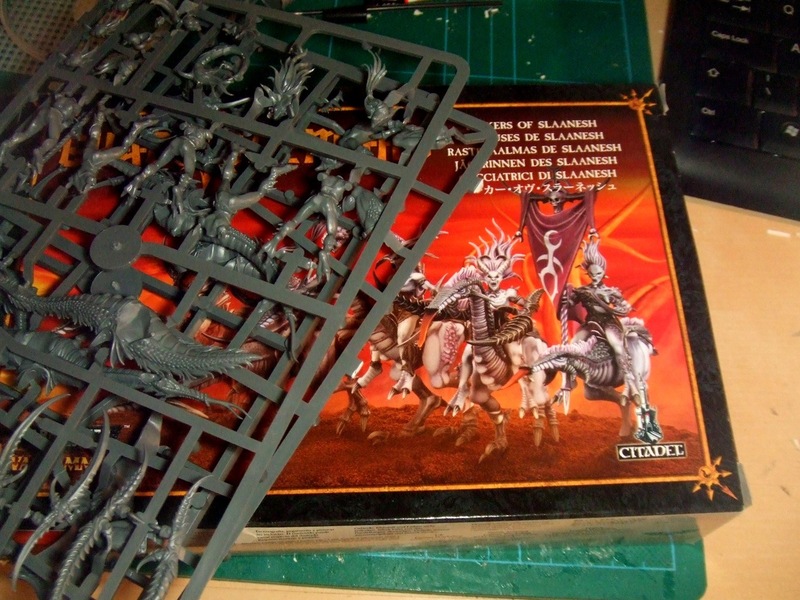 It covers stuff like allocating resources, purchase priorities and some basics on assembling and painting a mob. 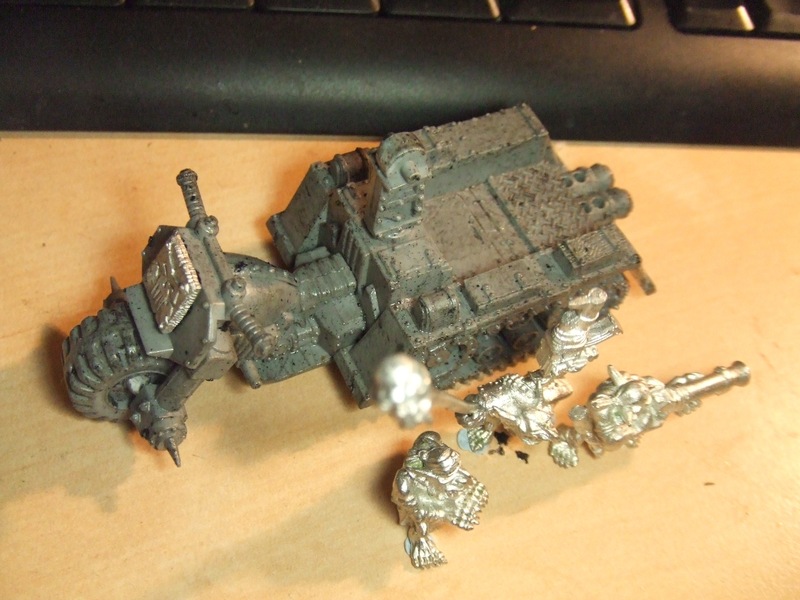 Admittedly the painting isn’t excellent and the models look tiny compared to modern orks, but the principals hold true and the vehicle converting stuff isn’t bad either. 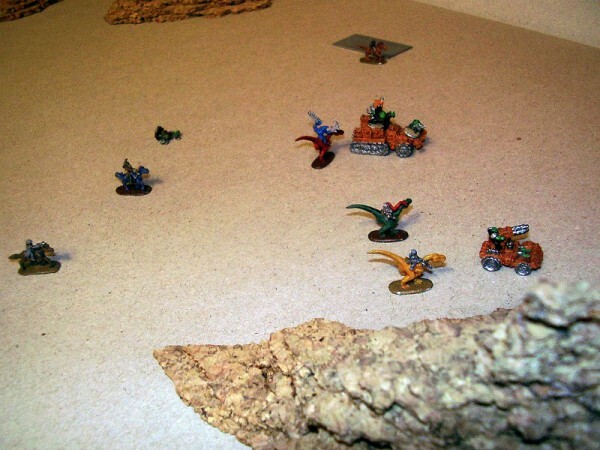 I’d say that if you’ve played one of the similar games, such as Necromunda, it’s an article you can safely live without. However, if you’re feeling a bit overwhelmed with everything, it’s an excellent starting point. 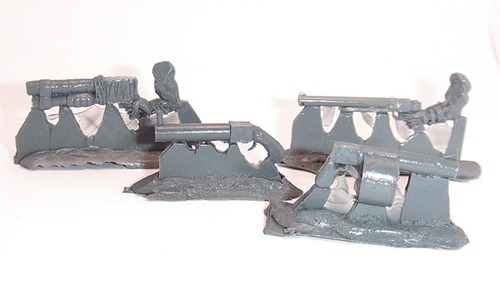 In my recent terrain article I gave a few bits of advice on spray paint, I actually went a bit overboard I feel, given that I was trying to just mention the subject. Then again, it’s a subject that is pretty important in my eyes, so this is actually going to be my first two-part entry. I could go into why to use spray paint, but I don’t think it’s worth it. 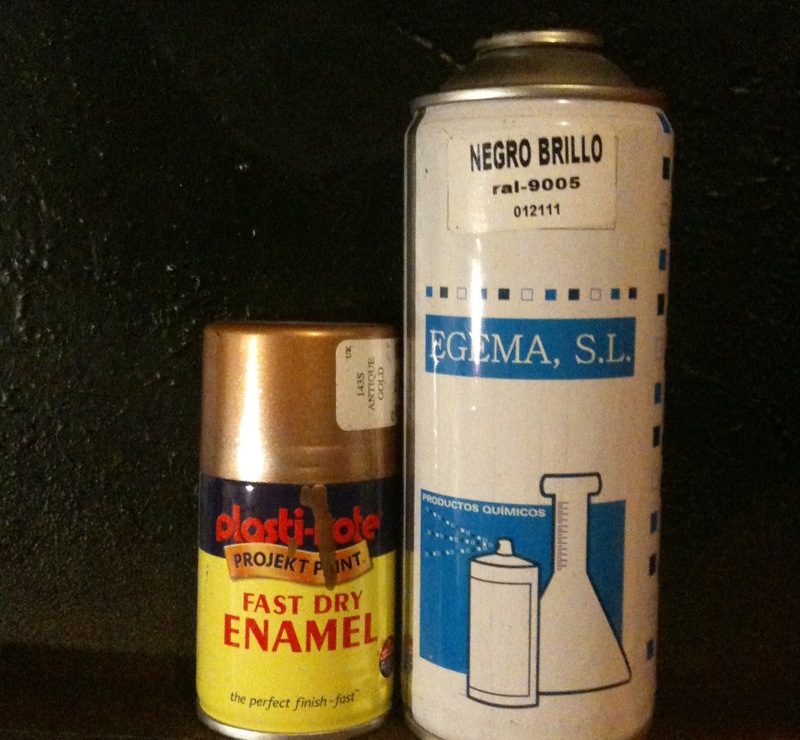 If you want to use spray paint, I’m sure you’re already aware of some of the reasons. Instead I’m going to give some tips on paint selection and protection. I also apologise for the UK-centric nature of many of the bits of advice I’m going to give, but there’s probably plenty of stuff for those of you in the US. As for the rest of the English-speaking world, I’m afraid I can’t help with where to get paint – I don’t imagine it’s easy to get hold of in Australia, for example. I favour paint designed for graffiti simply because it’s leagues ahead of anything else I’ve tried. 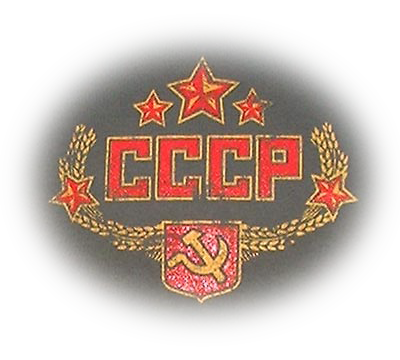 Not in that order, admittedly, I just wanted to spell CCCP. Depending on the manufacturer and techniques used, some paint cans contain more than others. I don’t know whether it’s just marketing noise or not, although I’m inclined to believe in “double thickness” claims by some manufacturers. Low quality paint cans don’t contain as much paint and quickly run out, make sure the paint you get has decent coverage or you’ll end up needing to buy more all the time. 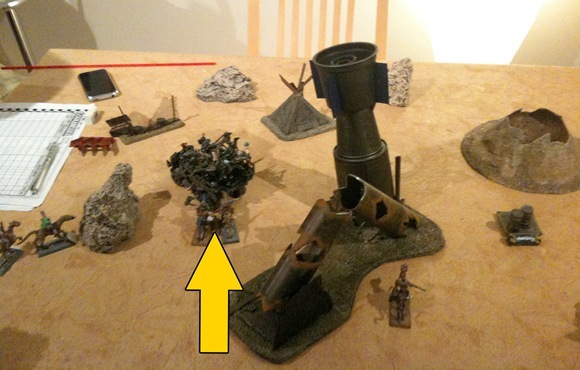 A single 400ml can should easily cover many terrain pieces and a crazy amount of miniatures. Generally-speaking the paint you’ll want to use should be quite thick. 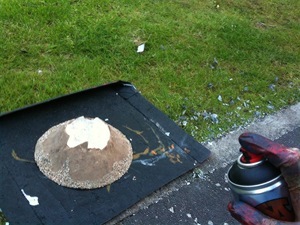 Runny paint quickly drips and ruins surfaces with built up paint where it has collected. Good quality paint sticks and stays there unless you lay it on insanely thickly – it’s designed to stick to vertical surfaces if it’s for graffiti – drips are a huge no-no on the graffiti scene, after all. I plan on explaining more about caps in the second part, but let’s just say this – if your paint comes with a tiny cap on top, chances are it’s garbage. All the good quality paint I’ve bought either has no cap or a chunky cap. By “tiny” I don’t mean the spray it produces, I mean the physical size of the white lump of plastic. Low quality paint often comes with a cap that is not only gives a terrible spray shape, but also leaks. Not good! This was something I learnt about later and recently noticed properly for the first time. Low pressure paint is a lot more controllable, it’s easy to press the cap just slightly to add a few finishing touches without showering a thick layer of unwanted paint on whatever you’re coating. Good quality paint shouldn’t be high pressure, unless that’s its selling point (high pressure isn’t bad per se, it’s just not desirable for our purposes). Check the can to be sure it says “low pressure”. In a great many shops one can buy plasti-kote paint, either in small tins as seen in the photo, or in bigger tins (400ml). It’s runny, high pressure, supplied with a terrible cap and takes many coats to become properly opaque. On the right is a can of some random stuff I got along with some other stuff. It’s essentially a no-name brand of paint and is both irritatingly glossy, high pressure and drippy. Now, this is at least somewhat excusable because it cost me next to nothing (I think it was part of an offer on a site and I was curious). Plasti-kote on the other hand is NOT cheap – that can of gold set me back £2.99, according to the label at least (I needed it at a few hours notice). I’ve done a quick check online for the 400ml tins and am getting results between £6 and £10. Six pounds for a can of terrible paint, dear gods..
Here’s a selection of some of the brands of paint I’ve tried and liked, from left to right: Belton, Bombers Best, Racing and Monster Colors. Of these, my two favourites are Monster and Bombers Best, although they’re all good. Other notable brands include Molotow, Montana and MTN. None of these cans cost more than £4, I think. Well, the Belton might have, but the Bombers Best was £2.25 I think, £2.99 or so for the Racing and £2.95 for the Monster. As you can see, the price is far more reasonable and the product much higher quality. Finally, safety first (hah). Ideally, wear a gas mask, not just one of those papery covers for your mouth – the gas is just as bad as the particles. 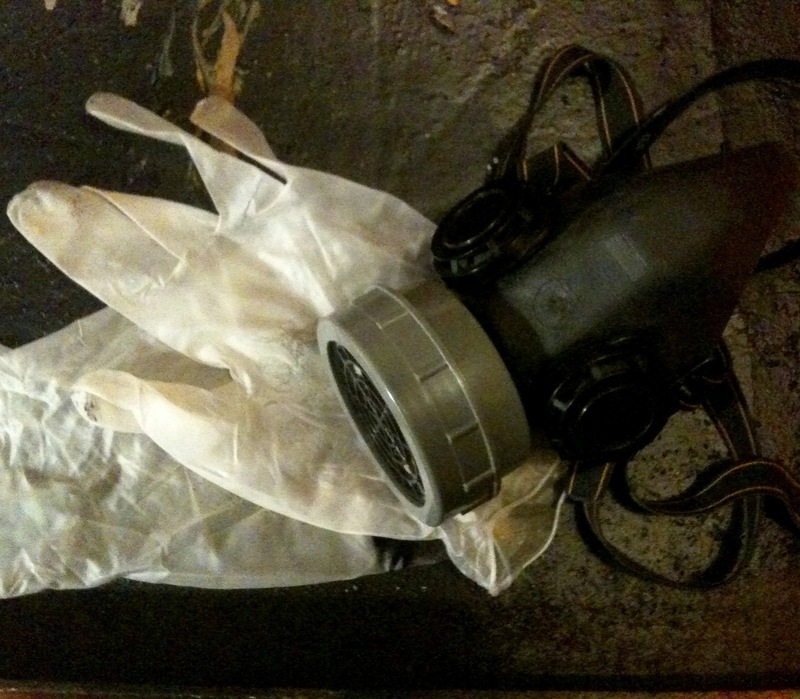 A gas mask won’t set you back much, £10 – £30, depending on your choice. It’s worth it for your body’s sake. A handy addition is latex gloves, not required, but useful. They stop you getting paint on your hands (this stuff isn’t water soluble!) and makes handling painted stuff a lot easier whilst it’s drying. I’d also recommend a decent layer of cardboard or newspaper to protect the surface you’re painting on – I use half an old pizza box. That’s about it for this tutorial, you can read the second part here. Any questions? Leave them in the comments below. 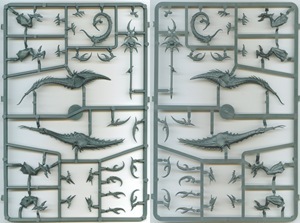 Here’s a two-part article that I think was originally published in White Dwarf, unfortunately we currently don’t have access to those, so this version comes from Gubbinz and therefore is in black and white. It was originally in two bits but we’ve included both parts in the PDF below, worry ye not. 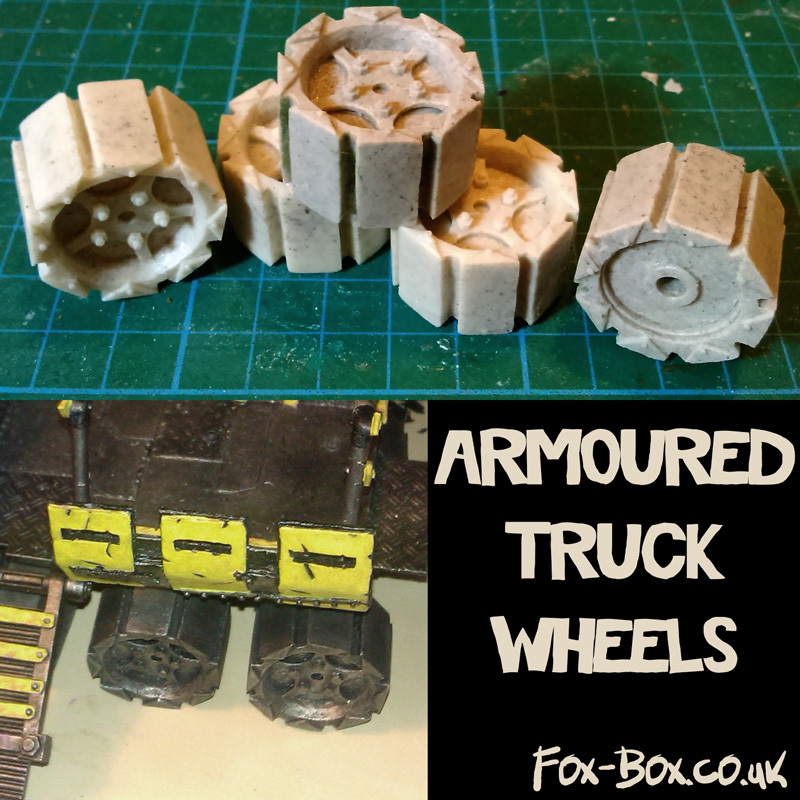 It covers rules and how to model some extra gubbins, including wheel slashas and boosta rokkits, amongst other random odds and ends. 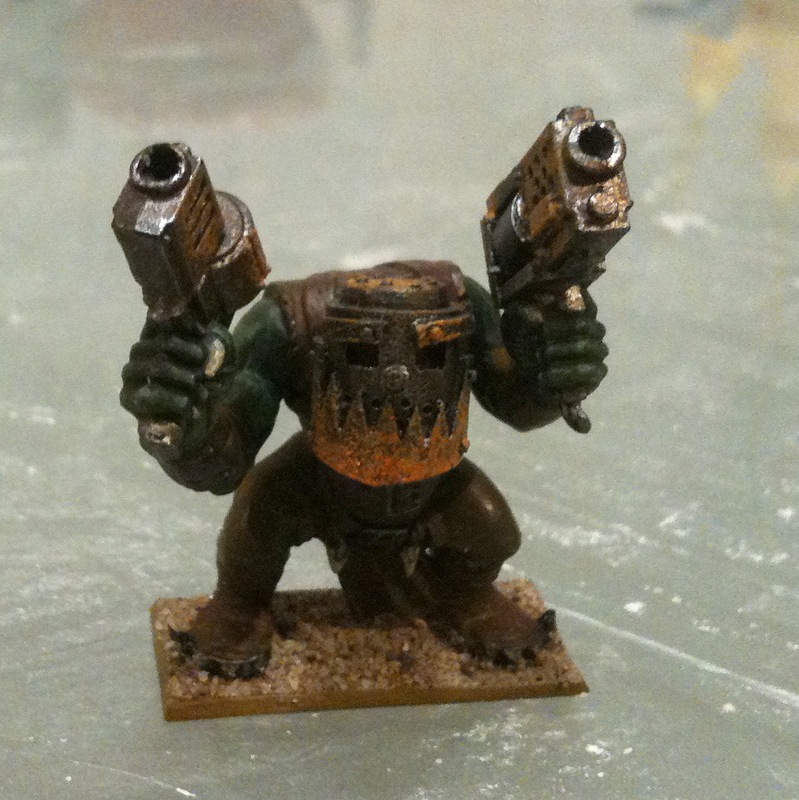 When preparing for our Gorkamorka campaign we ran into a minor issue – modern 40K orks don’t have kannons or six-shootas. There’s other weapons like crossbows too, but those two were the biggies. 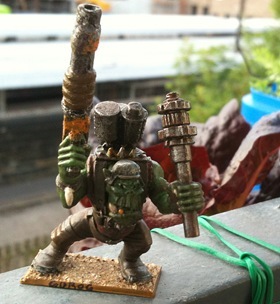 I have some old GM kannons, but they look positively weedy in the hands of a modern ork boy. I’m wondering how others get around this issue?